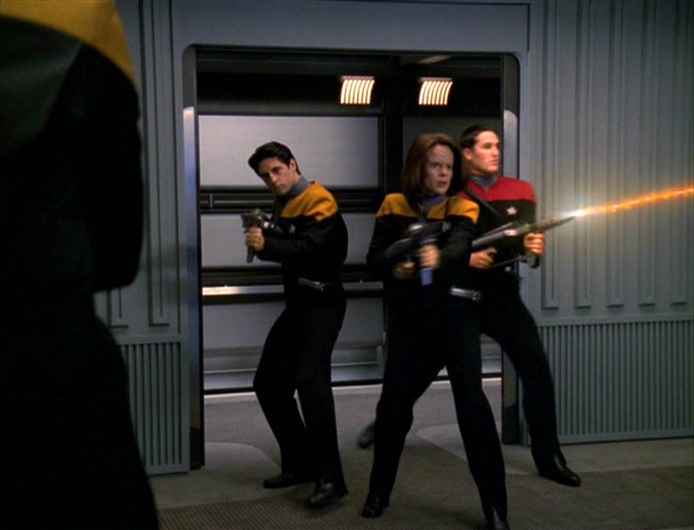 A recent development, carried on newer starships such as the USS Voyager. 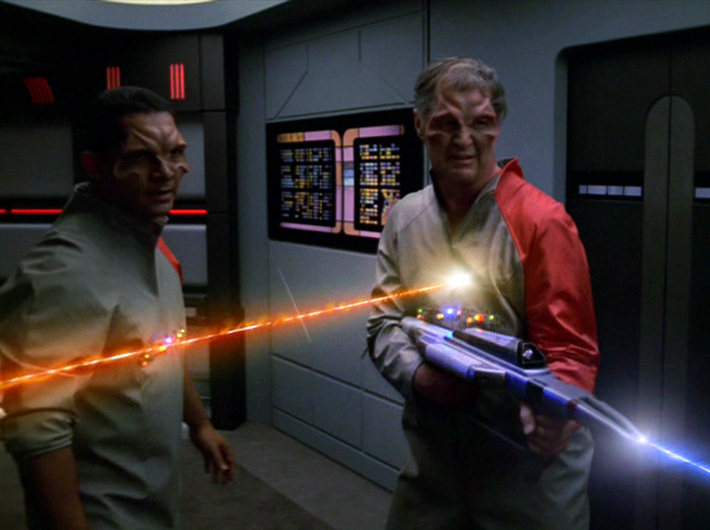 This has an improved targeting light, two power clips and a new-design split emitter. 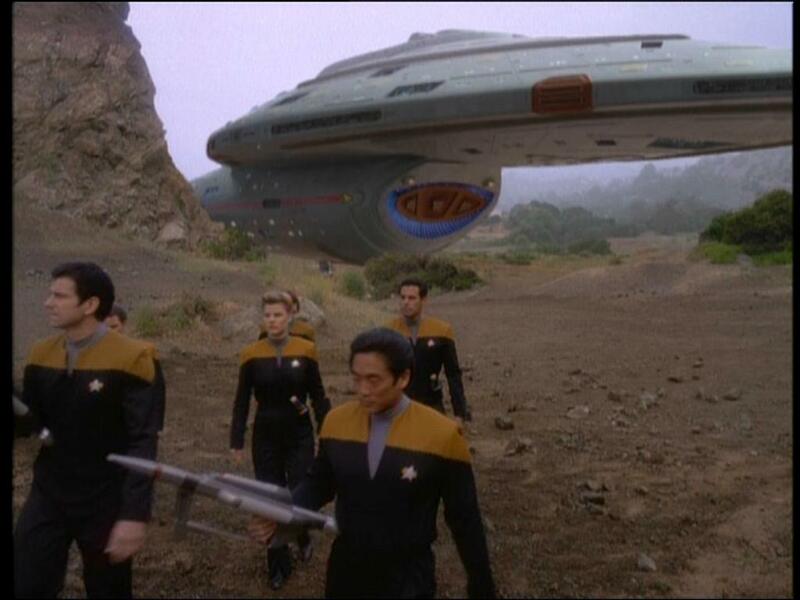 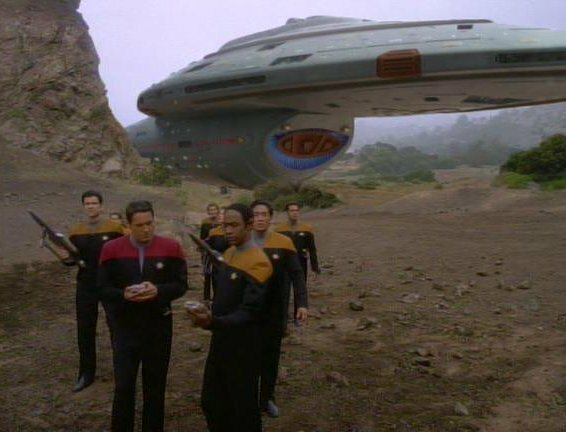 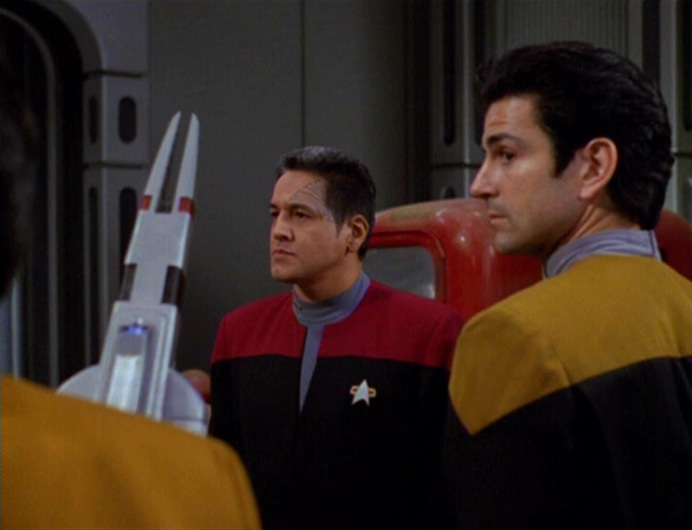 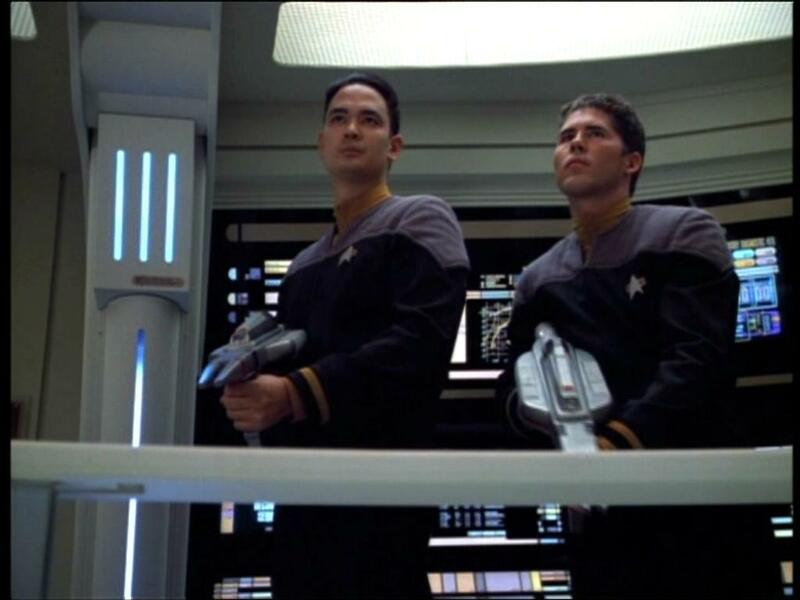 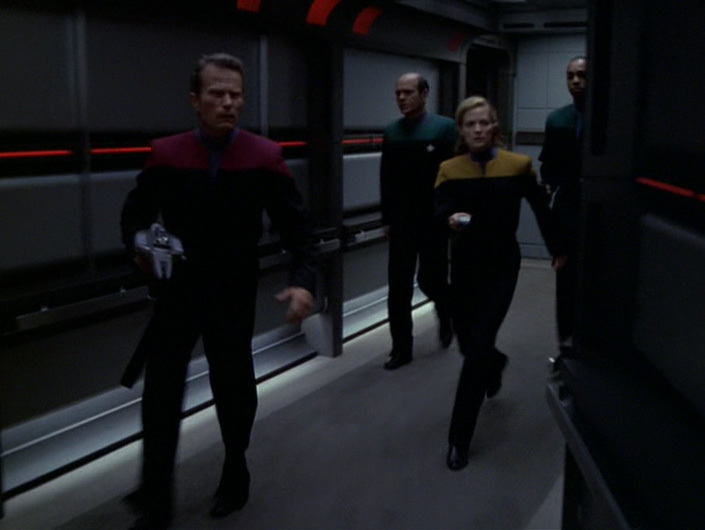 Carried on Voyager and nowhere else, it seems, apart from a couple of Security personnel in "Message In A Bottle" - did they come from the Akira-class or the Defiant-class starships featured in that episode? 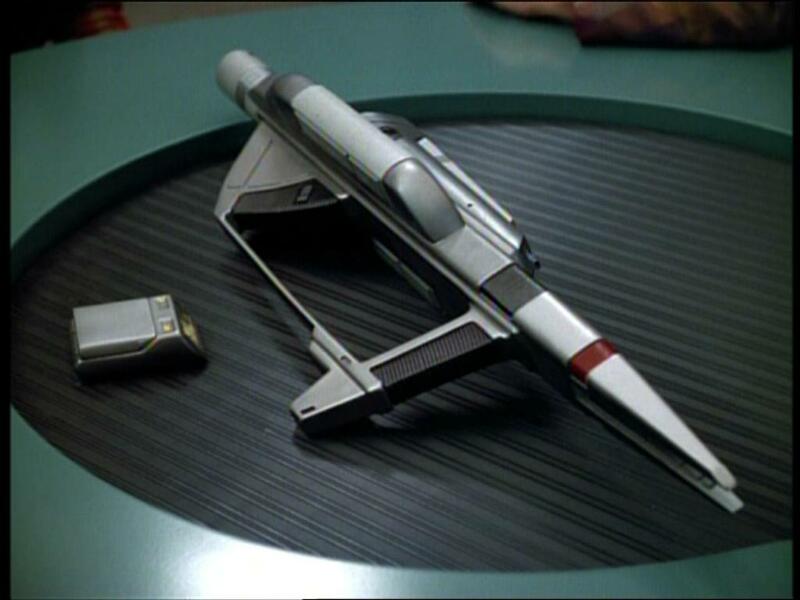 However, it would now appear that the design was in use as early as 2371, after this model was seen on the Nova-class USS Equinox (launched 2370) in "Equinox." 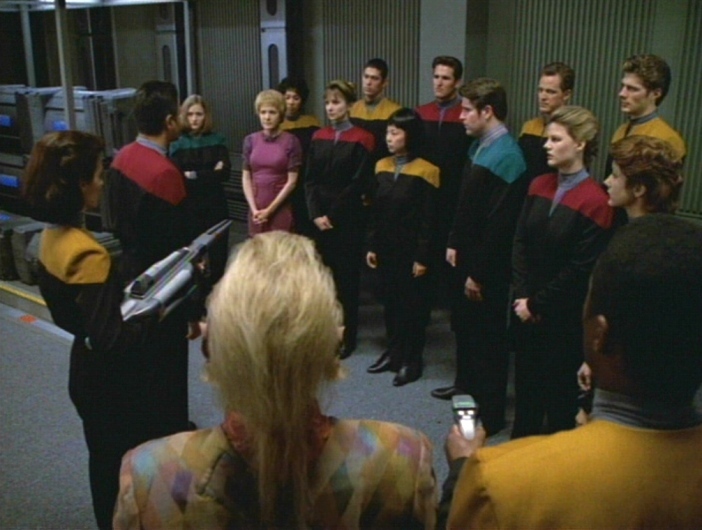 For the first two seasons it was not seen very often. 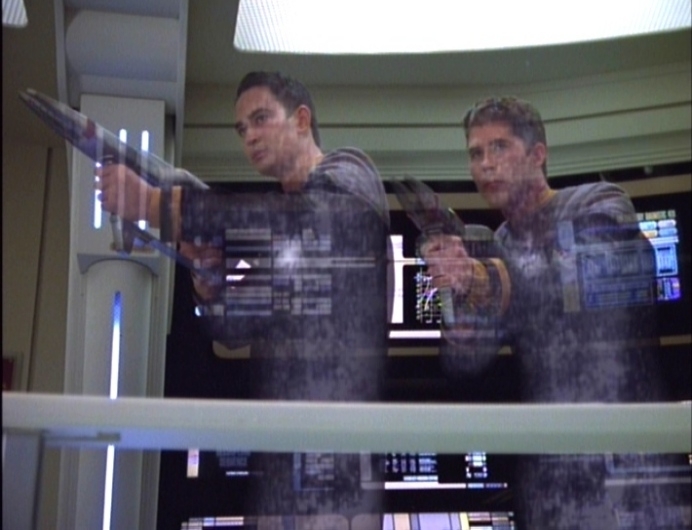 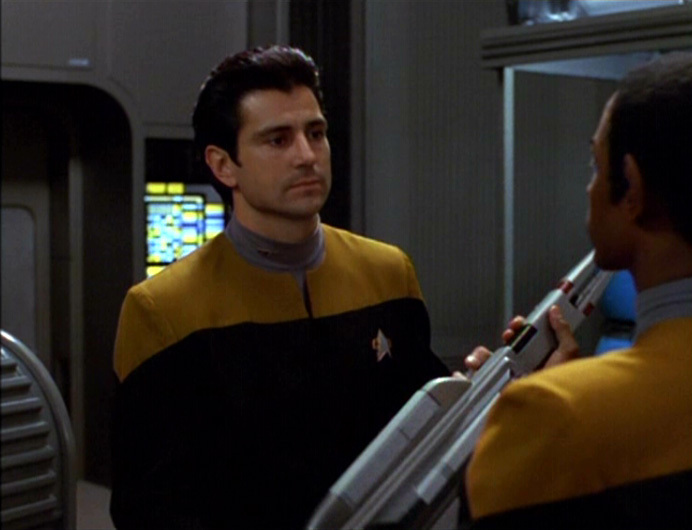 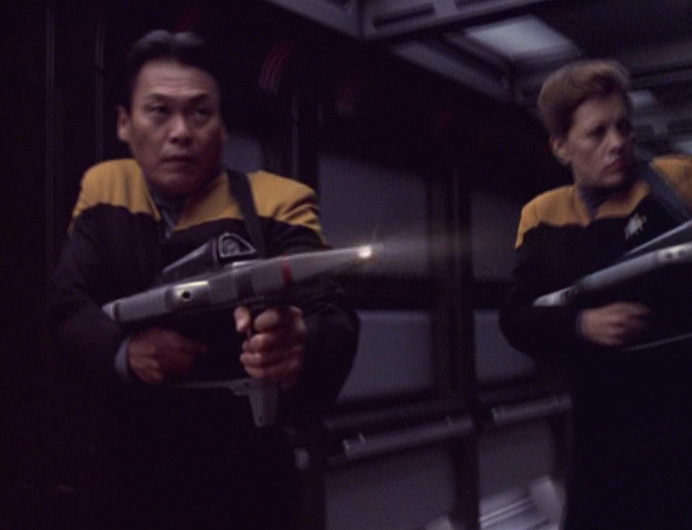 Then, after Voyager magically acquired the First Contact rifles in season 3 and 4 both models were seen equally, but with the CPR appearing less and less in favour of the FCR. 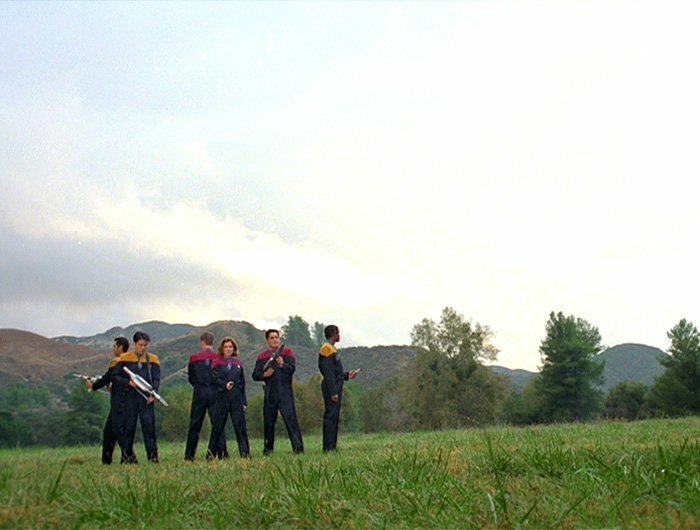 But from season 5 it was ubiquitous and unique; I suspect the Star Trek: Insurrection film crew nicked them back, and broke them all. 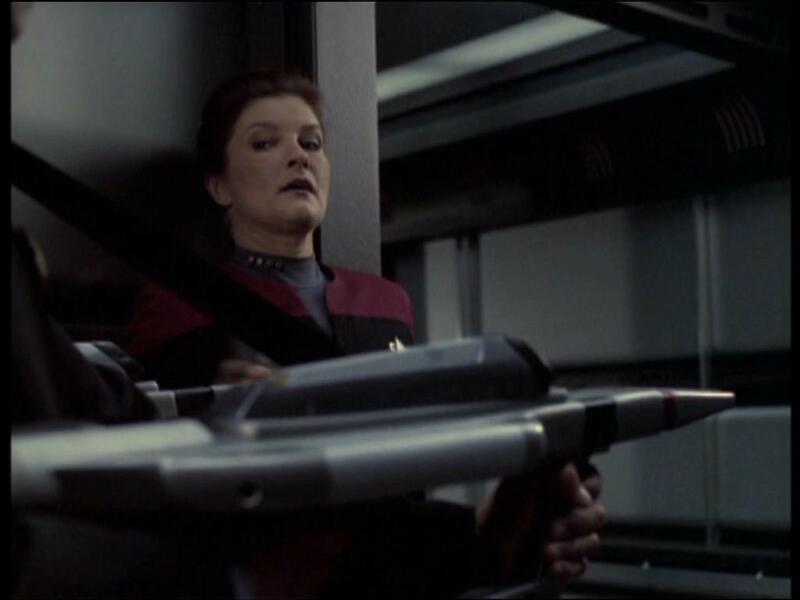 Klutzes! 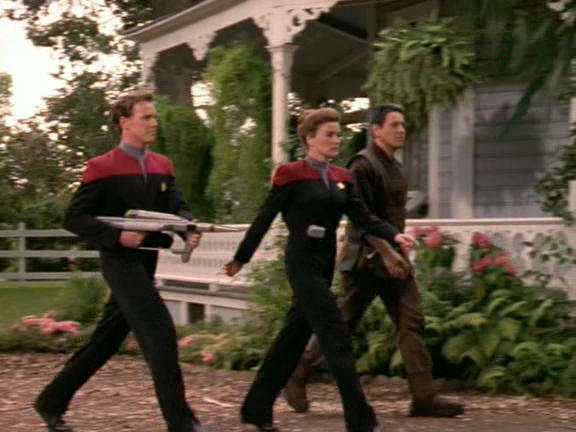 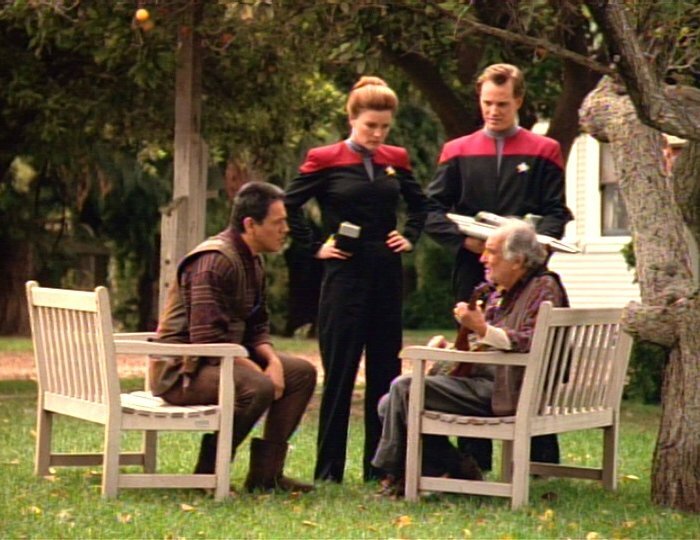 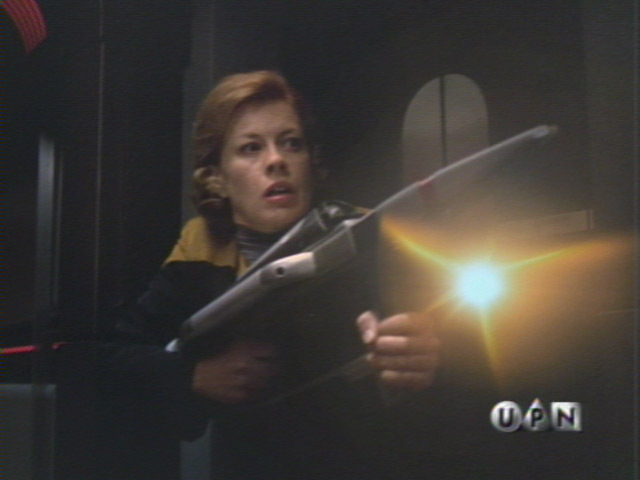 Dating would seem to bear some of this out - season 4 finished filming in early 1998, at the same time Insurrection was in principal photography; by the time season 5 starts in late 1998, the compression rifles are firmly back in the Starfleet inventory (as far as Voyager is concerned, anyway!). 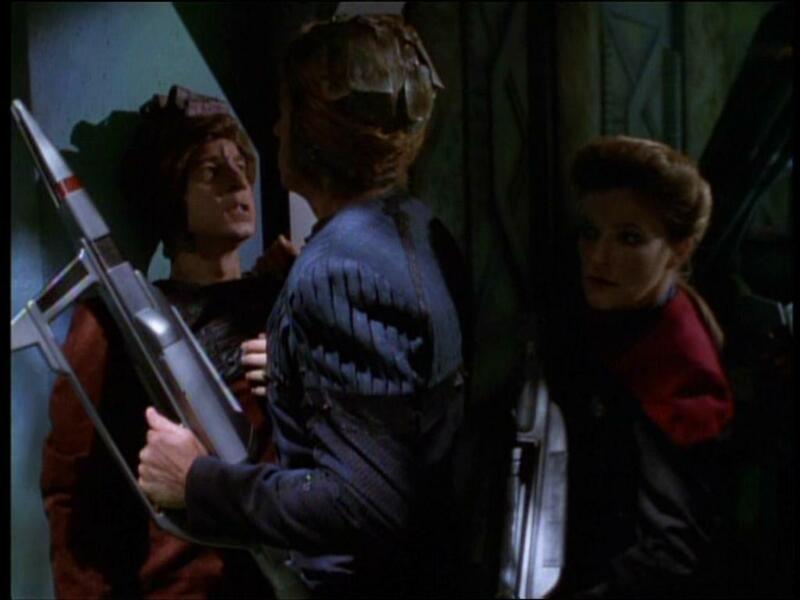 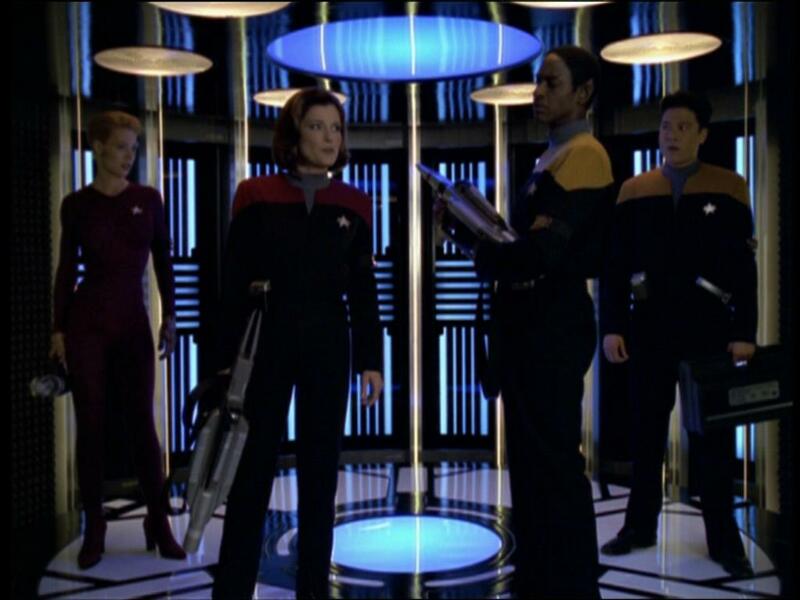 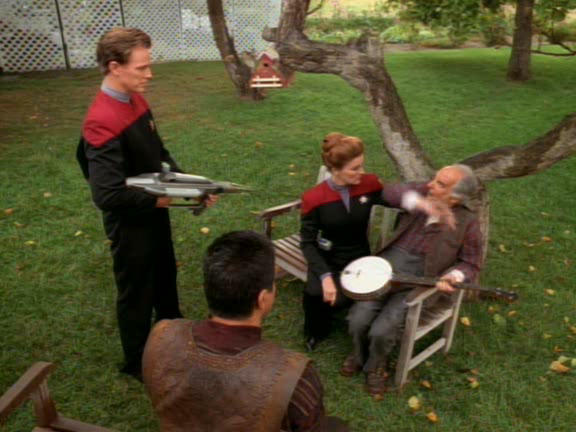 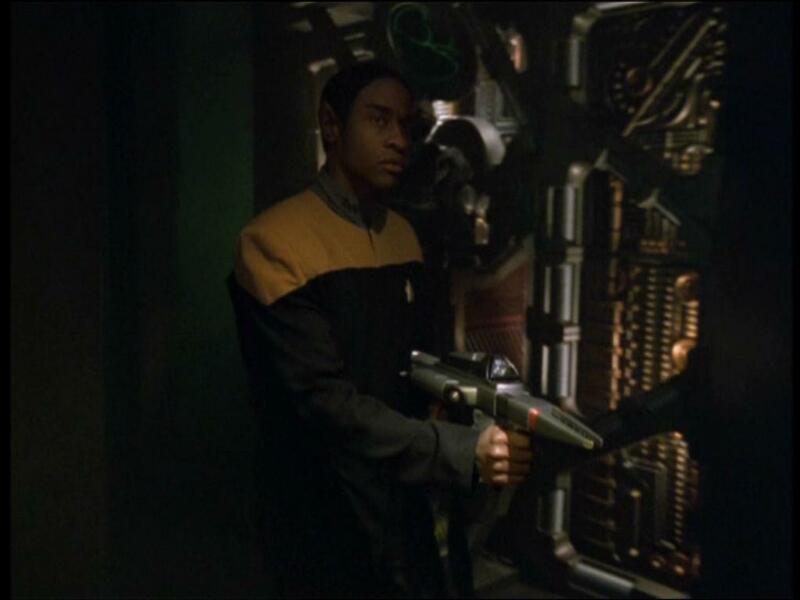 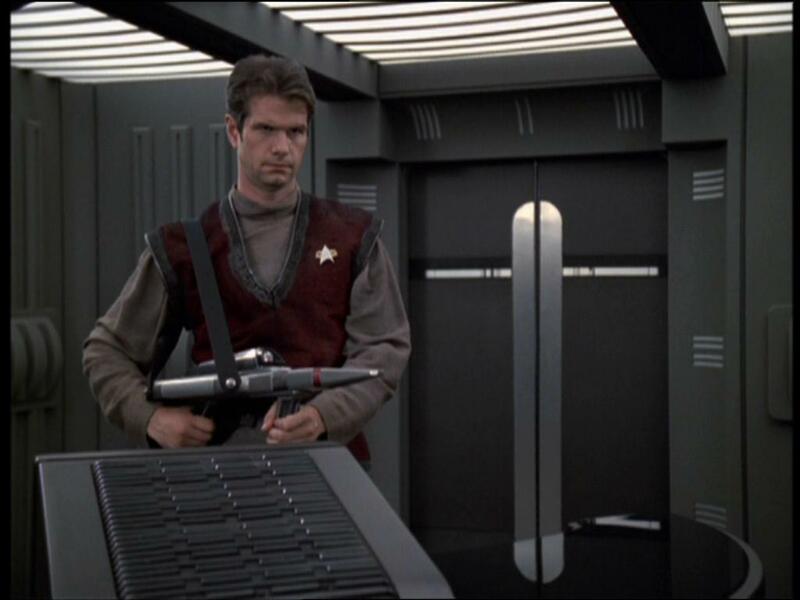 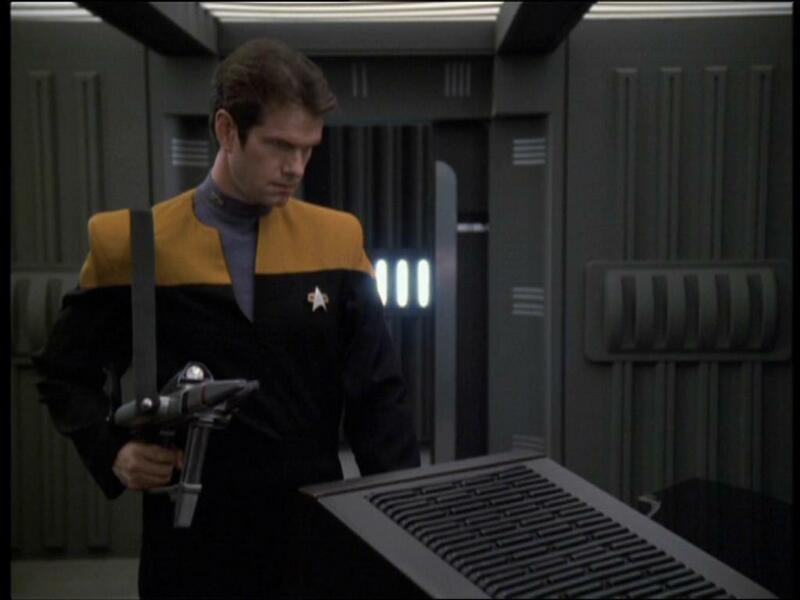 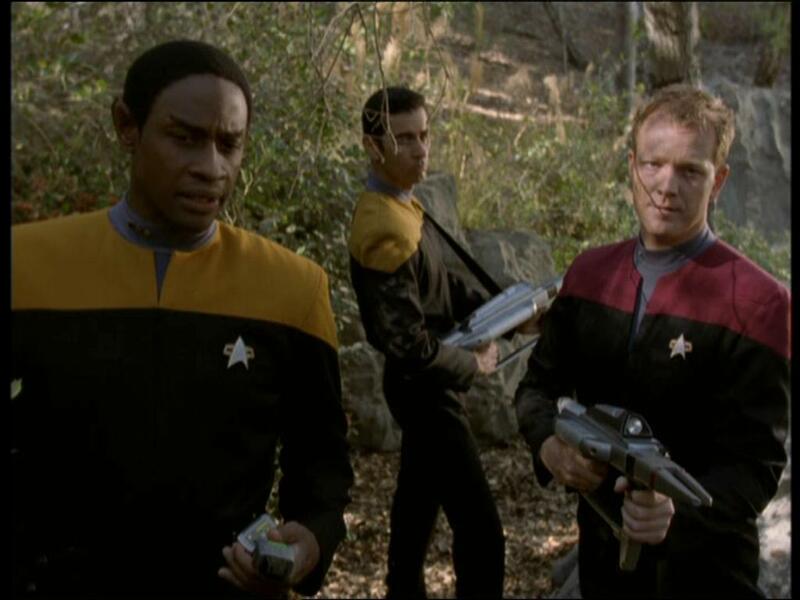 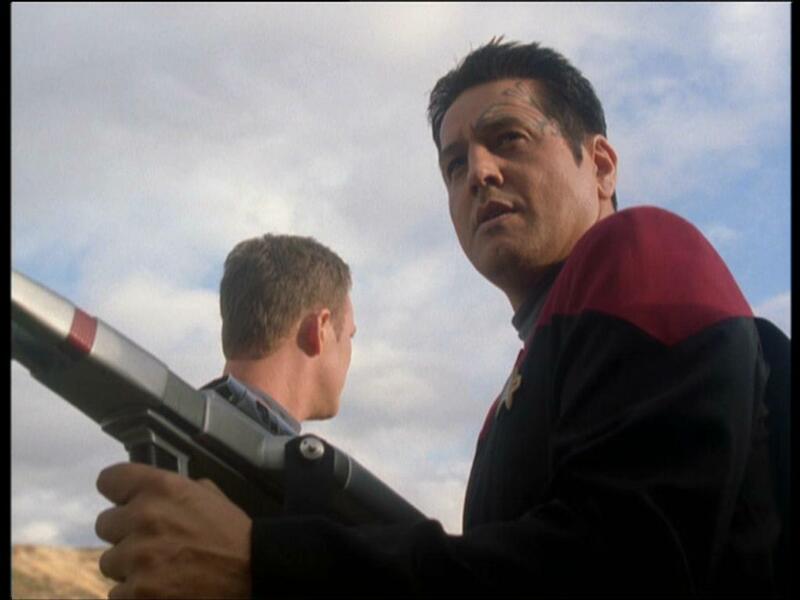 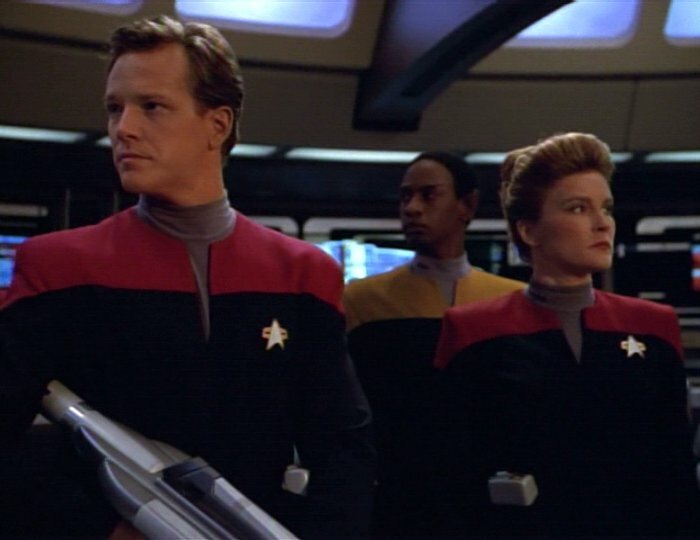 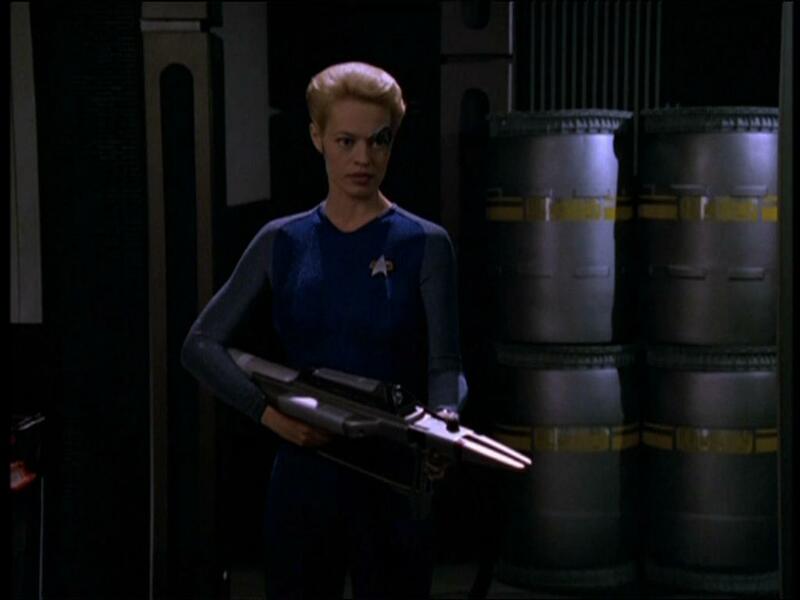 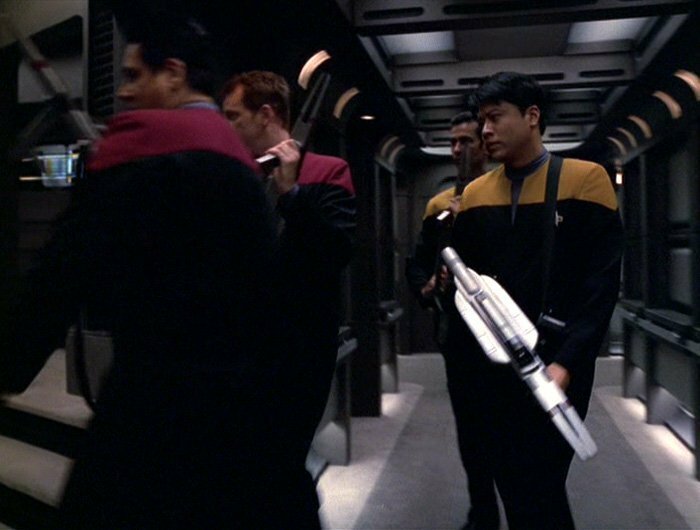 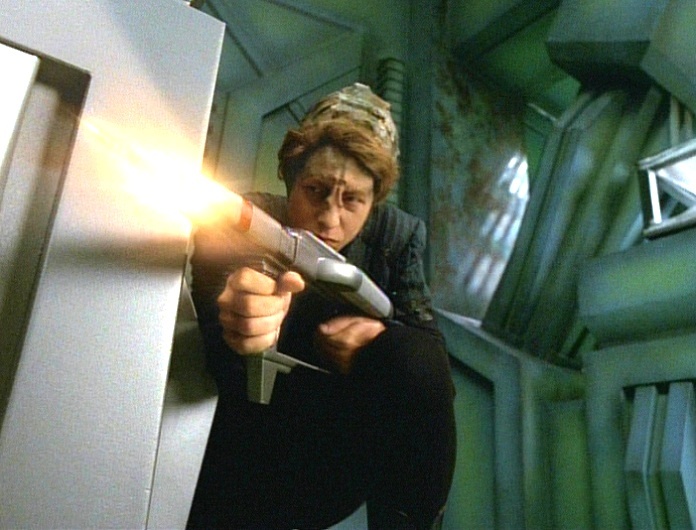 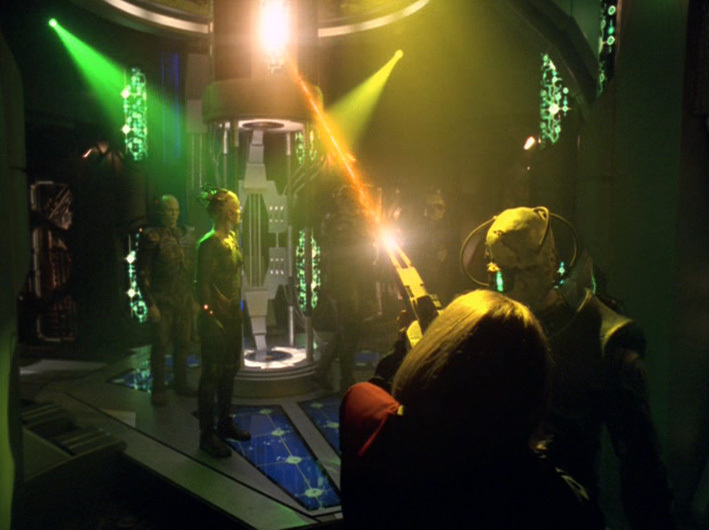 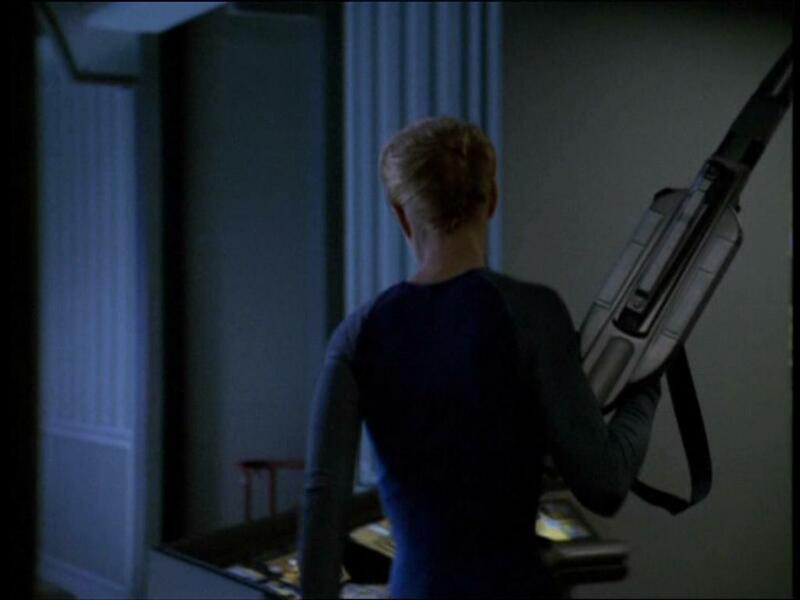 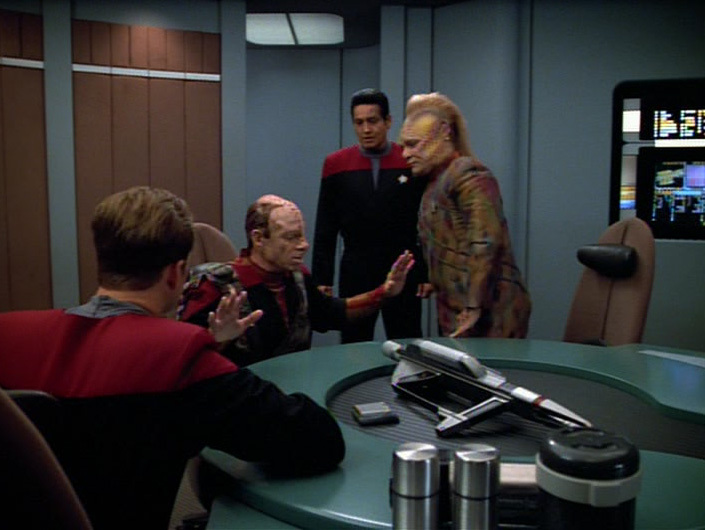 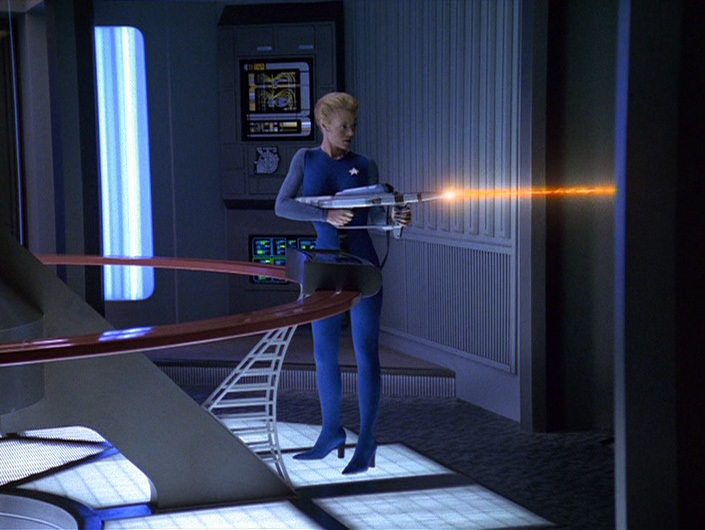 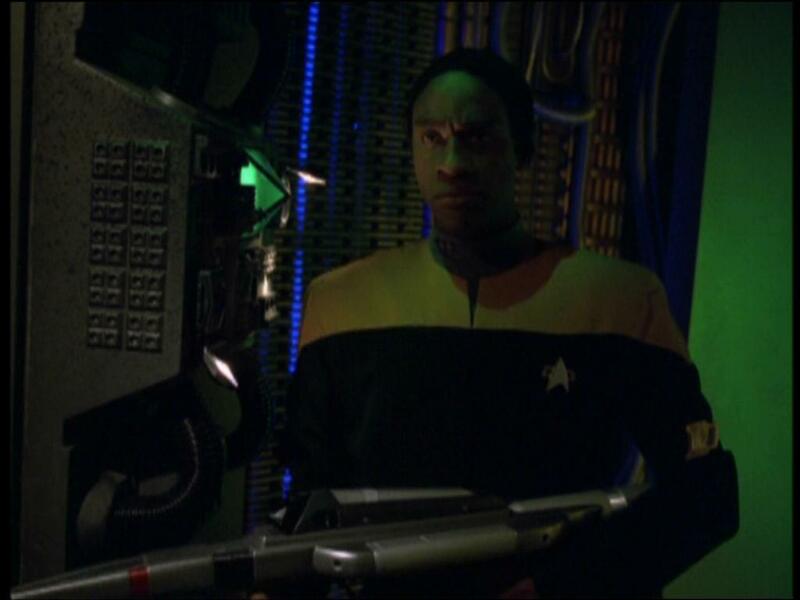 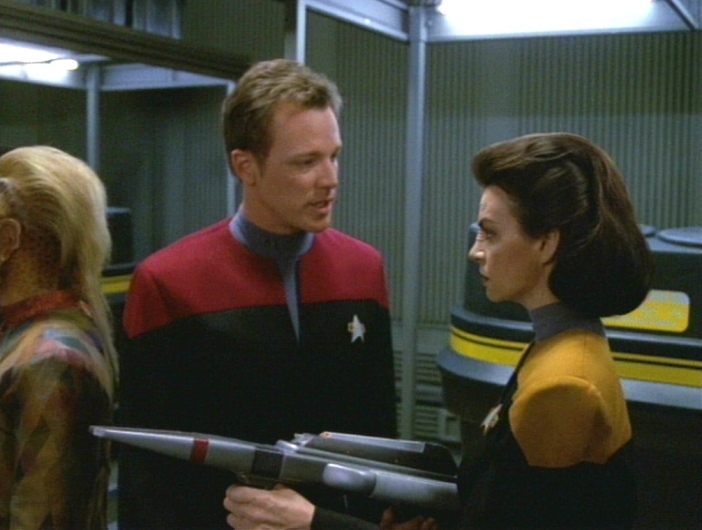 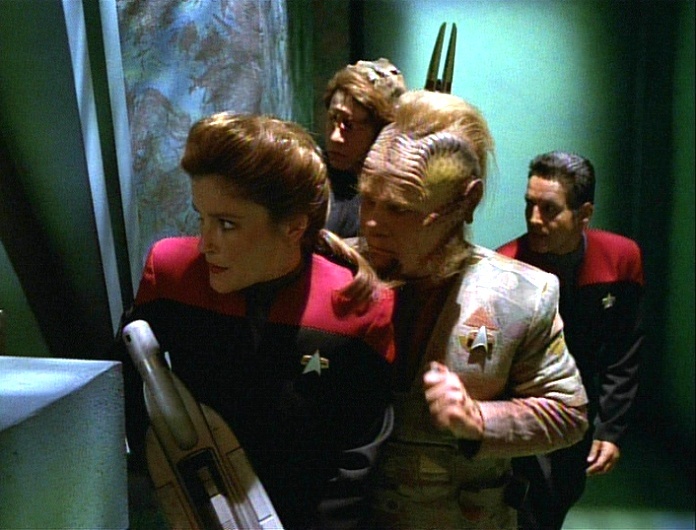 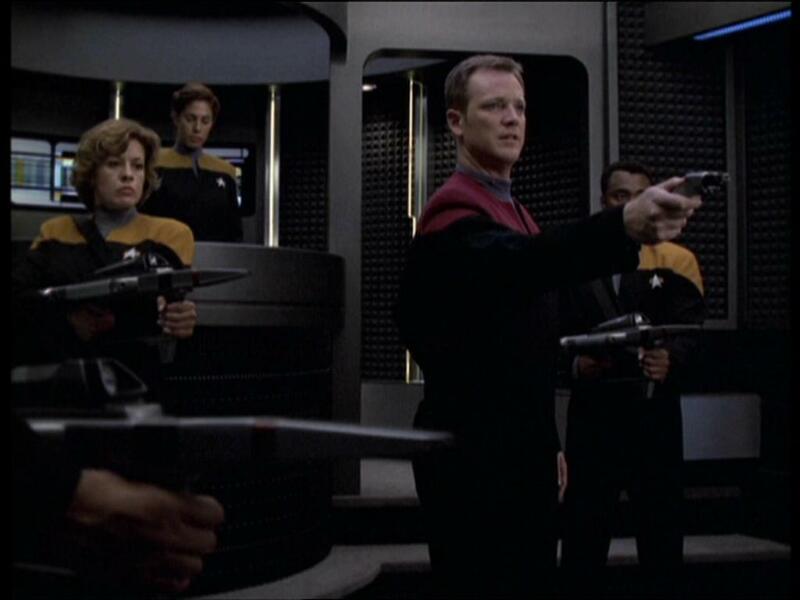 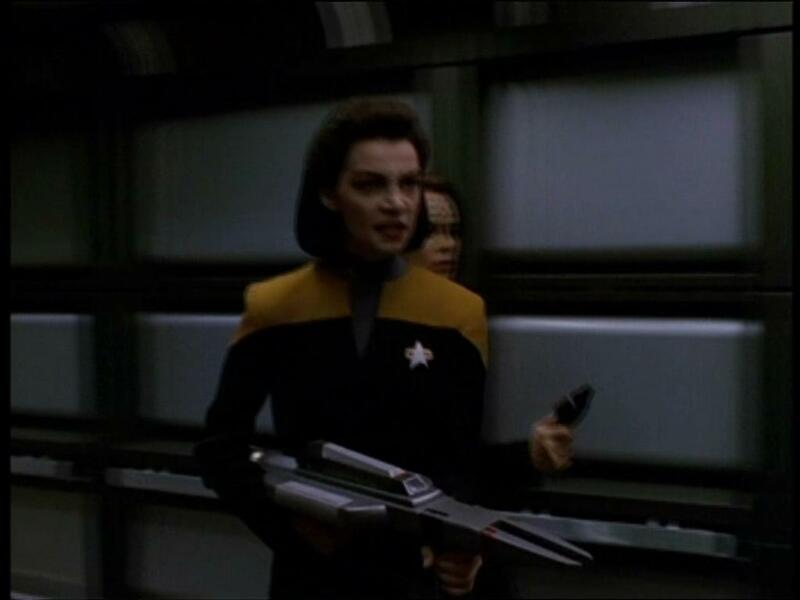 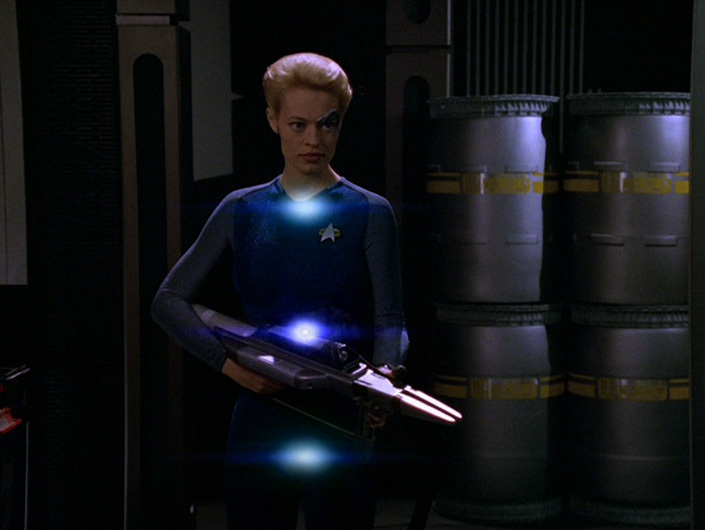 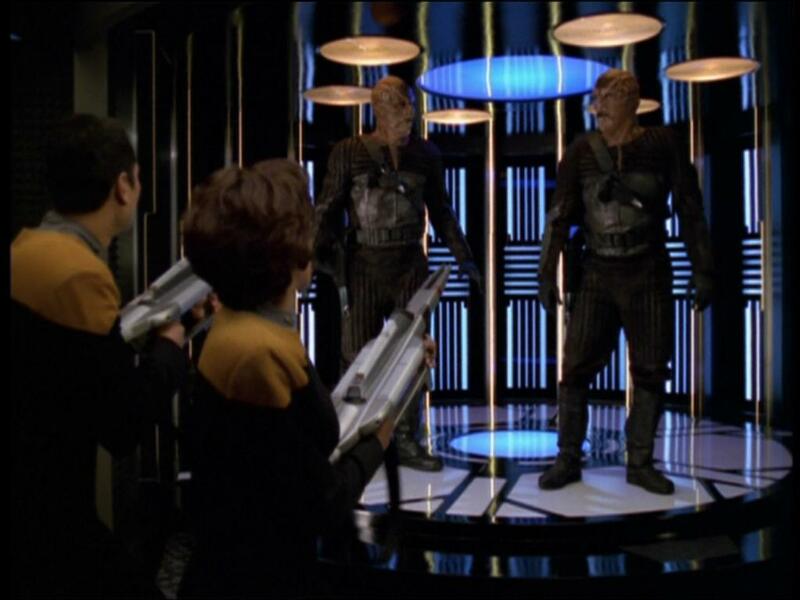 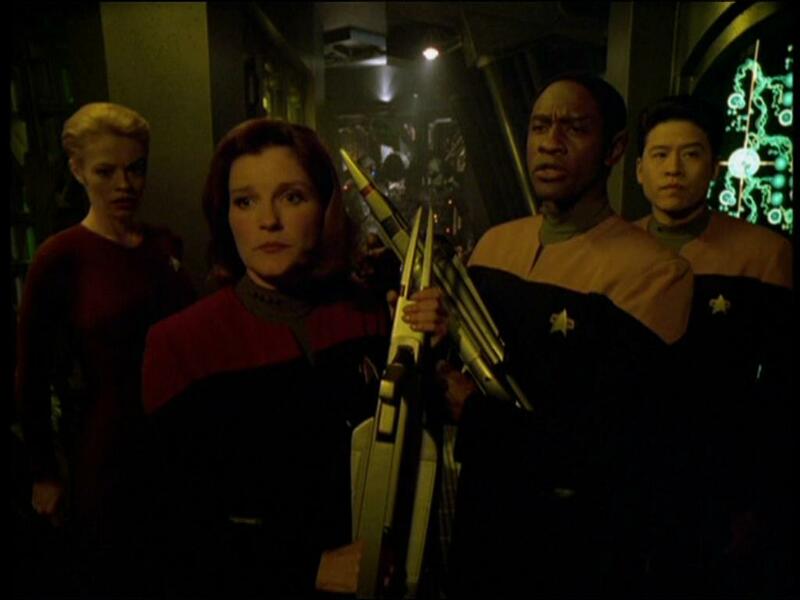 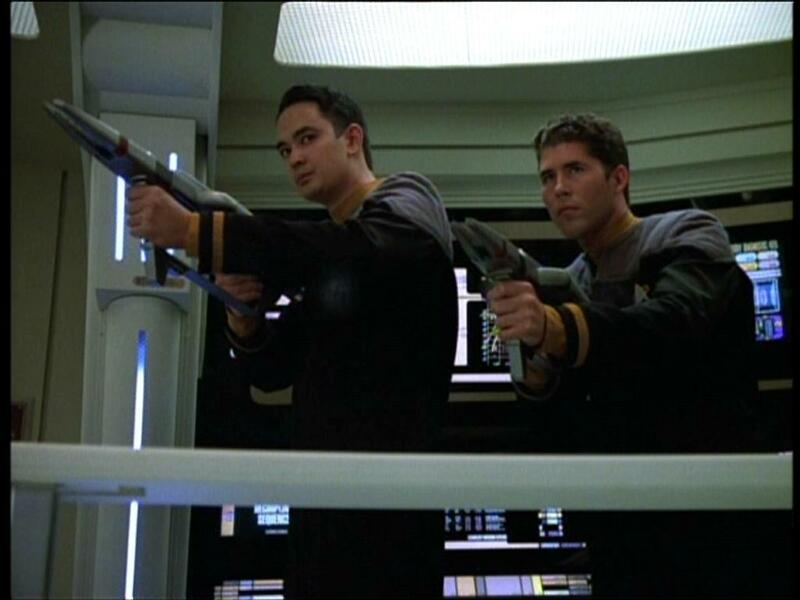 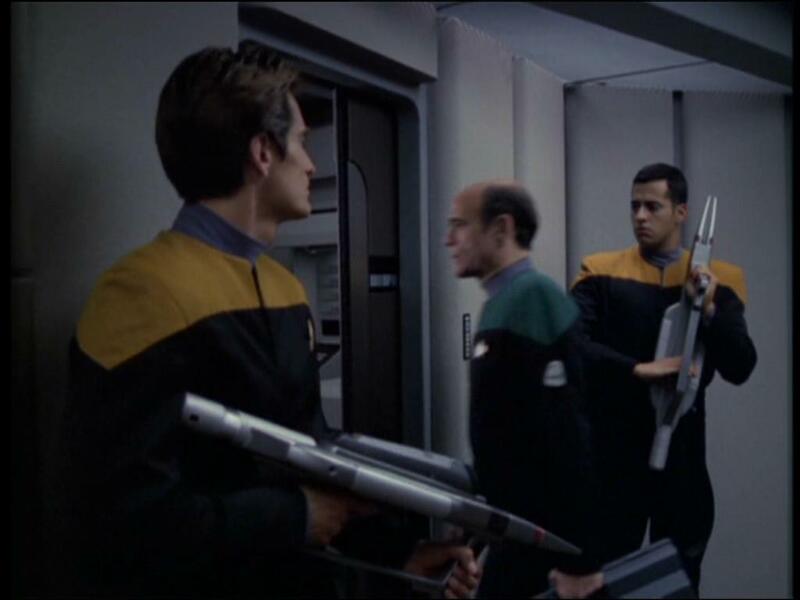 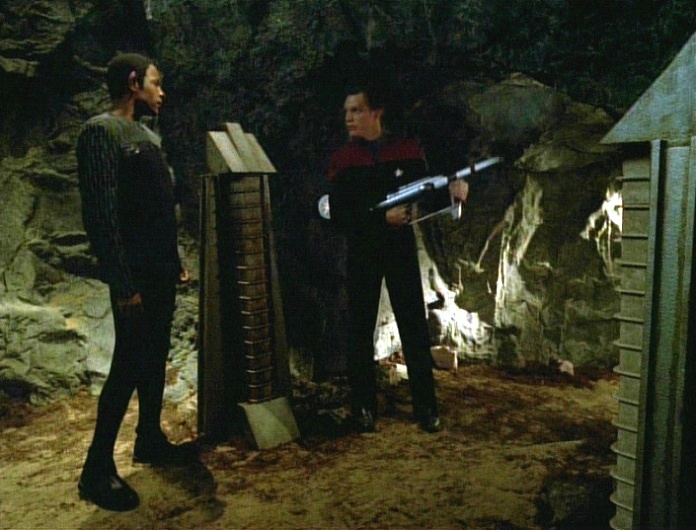 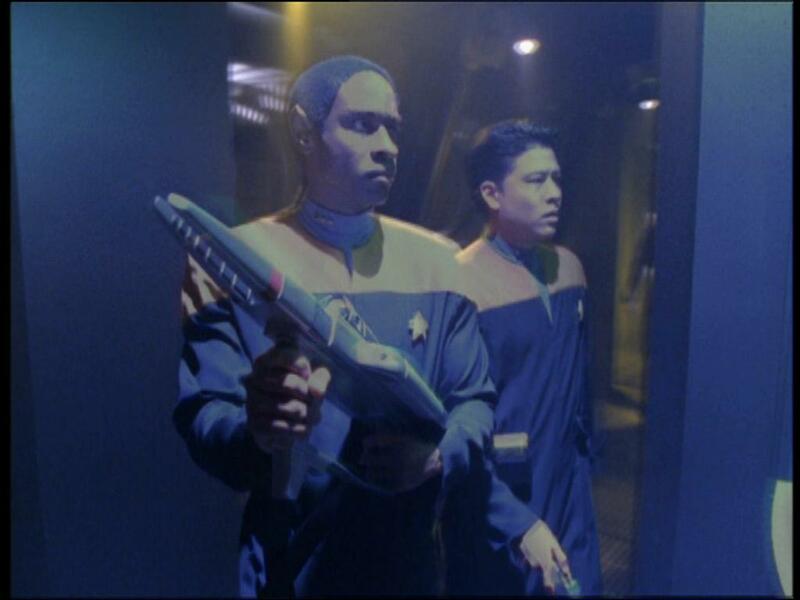 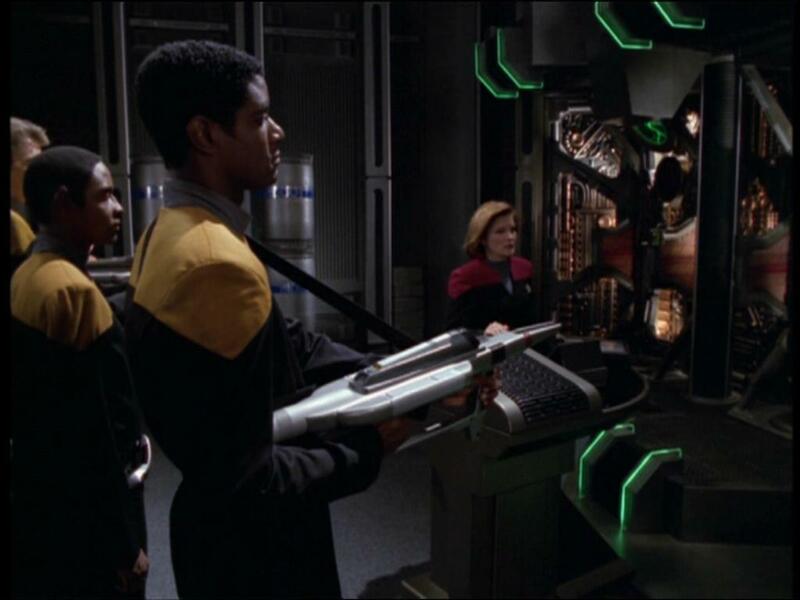 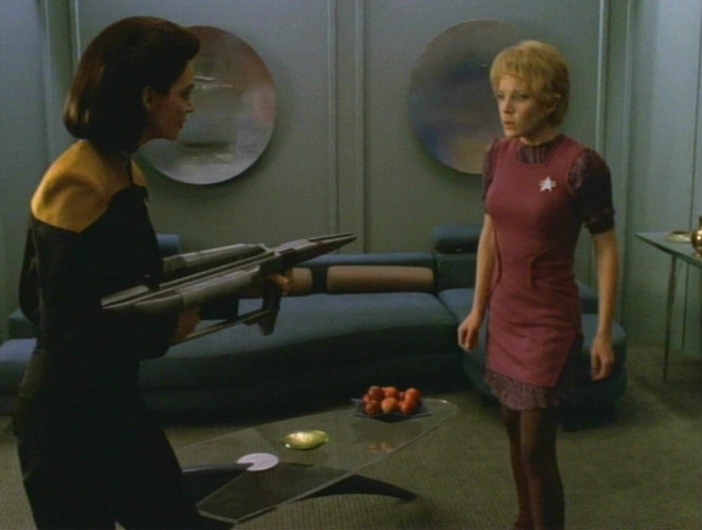 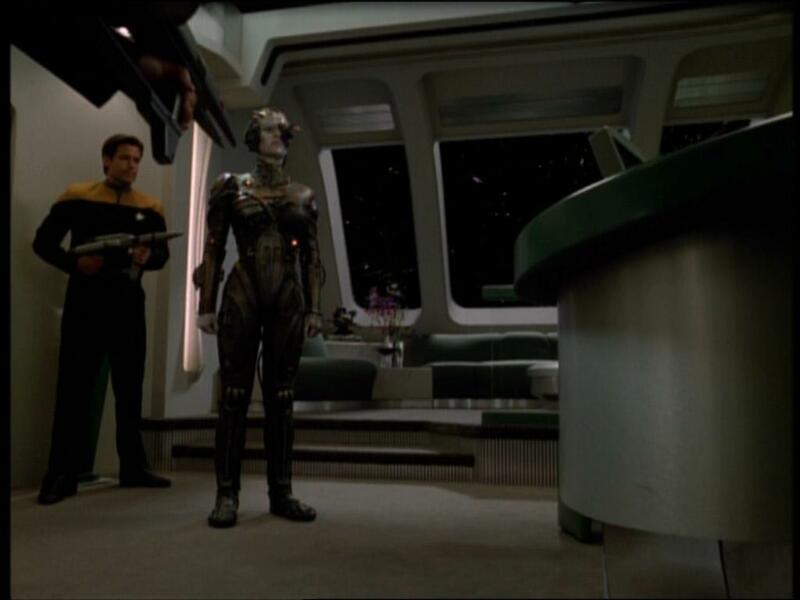 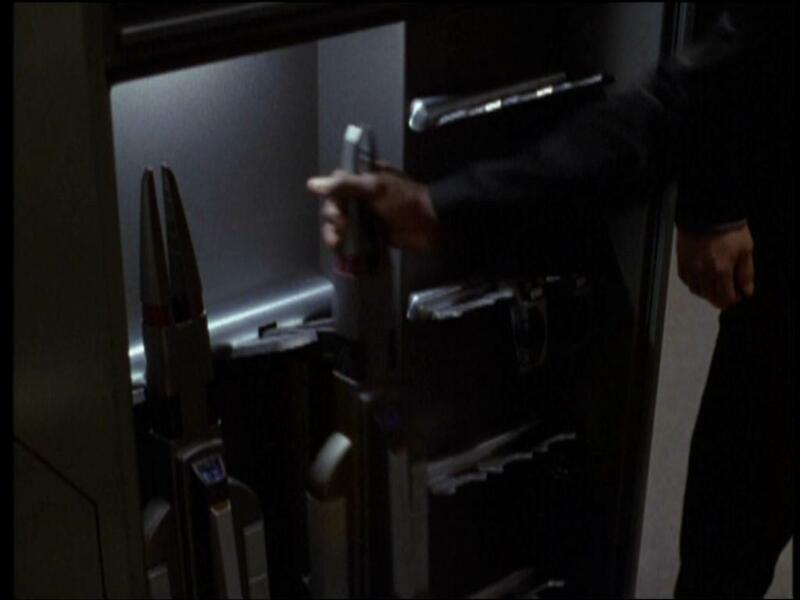 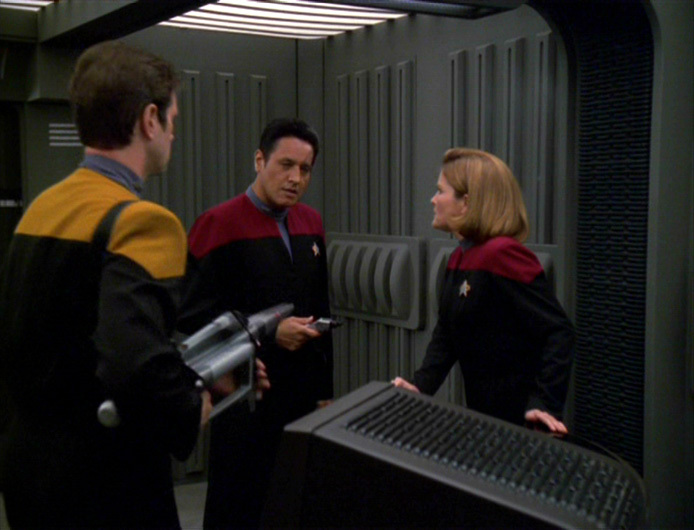 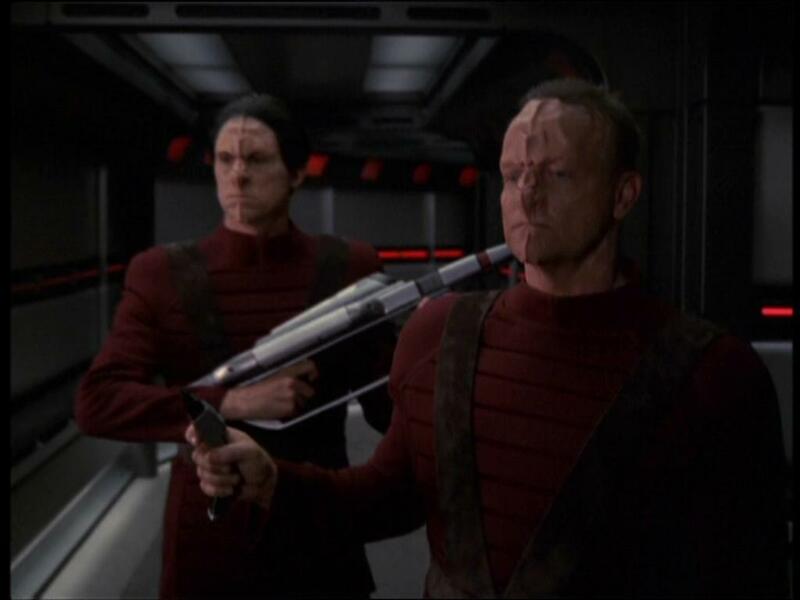 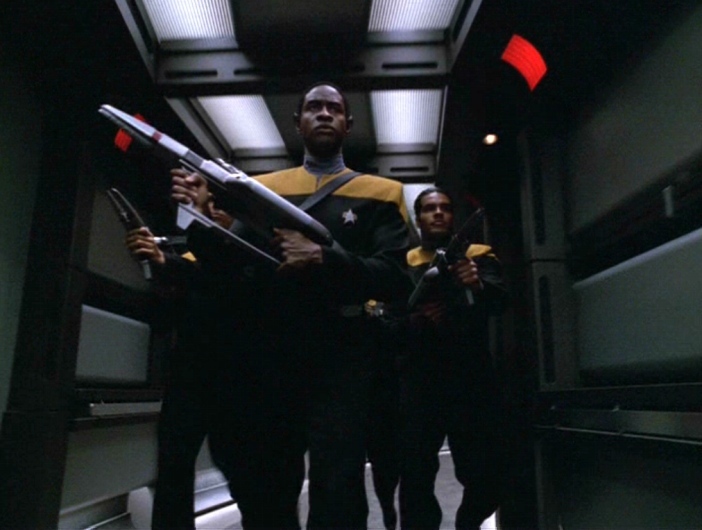 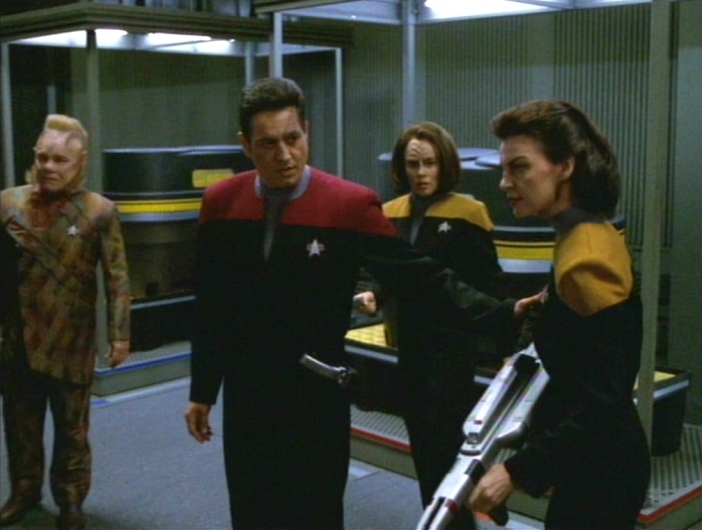 In the 6th-season episode "Good Shepherd," Seven of Nine makes a suggestion to Tuvok, intended to improve his Security division's efficiency: re-arrange the weapons locker to put the smaller phaser rifles at the front, and therefore improve ease of removal. 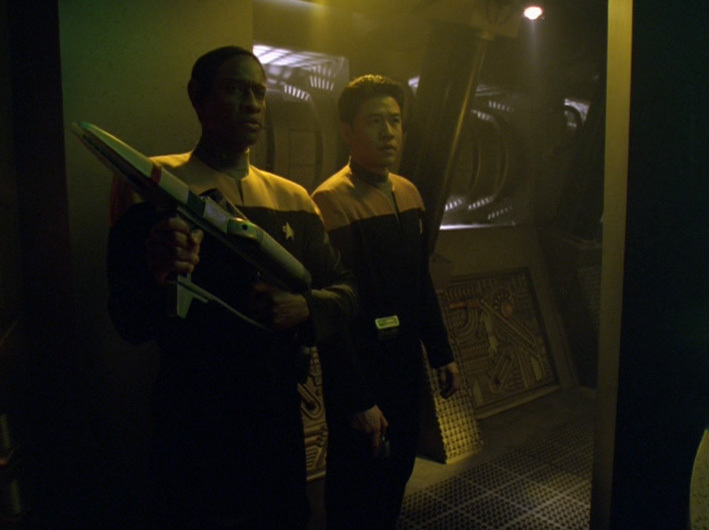 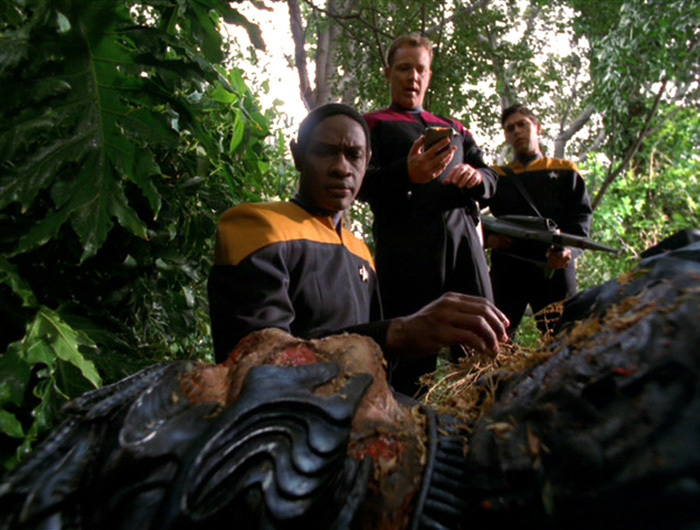 Tuvok promises to "look into it." 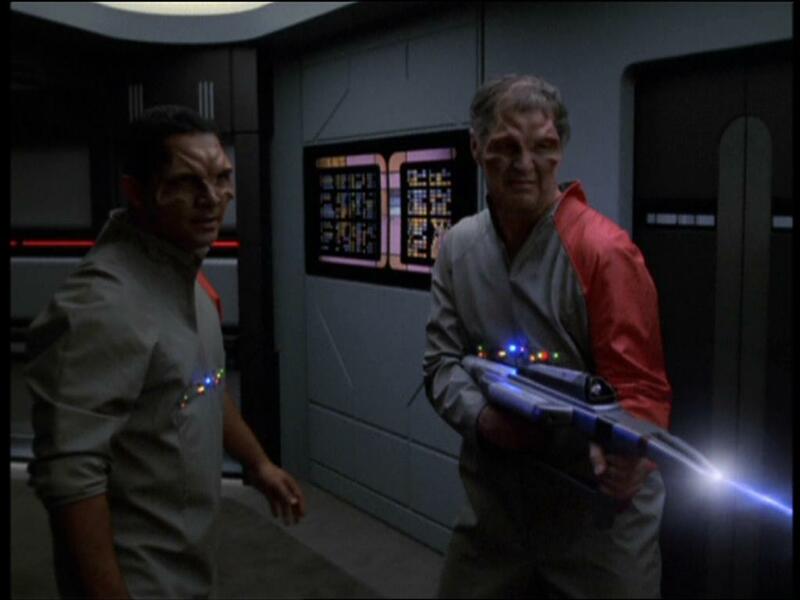 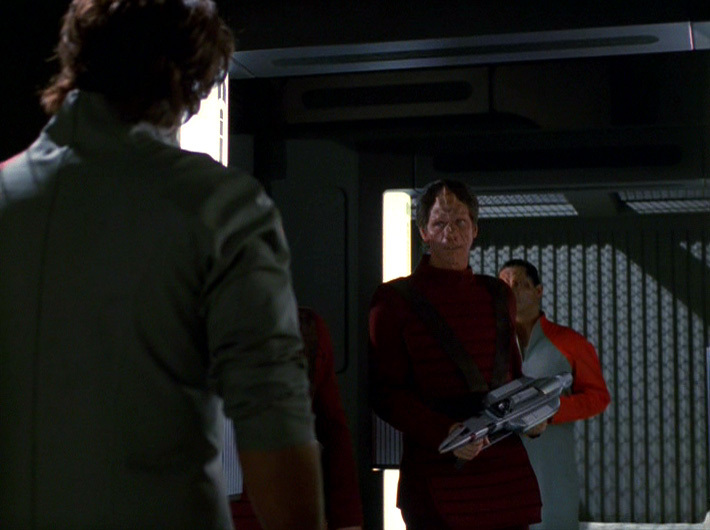 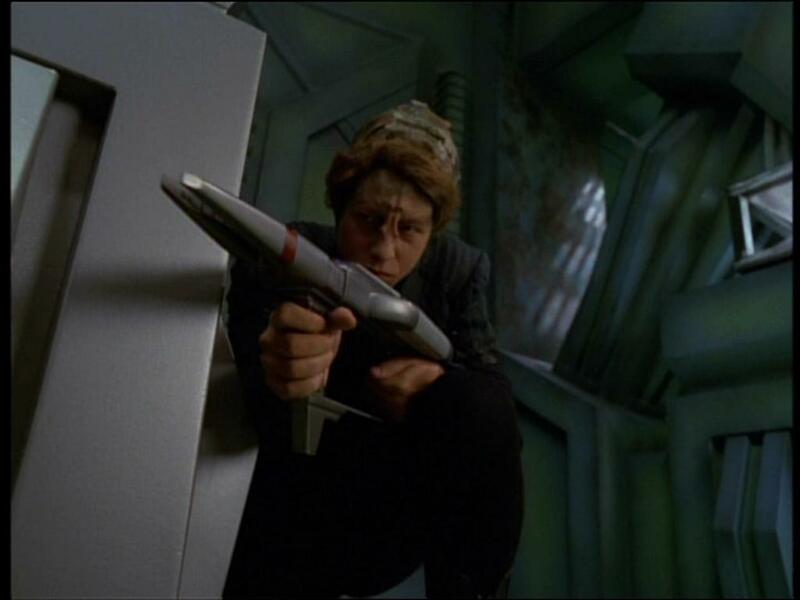 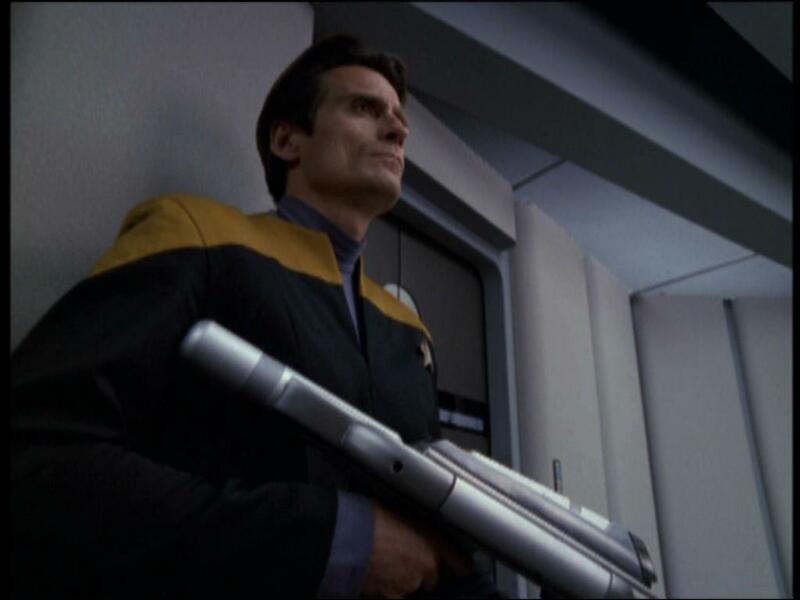 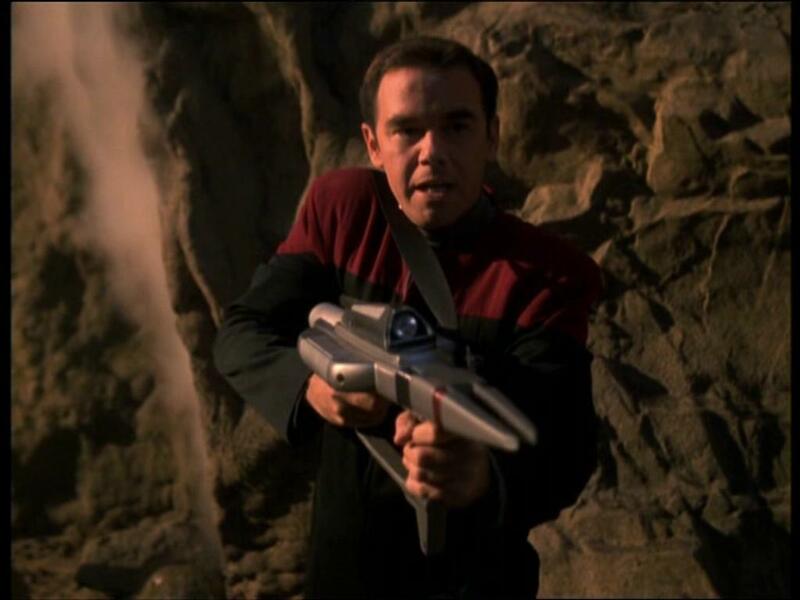 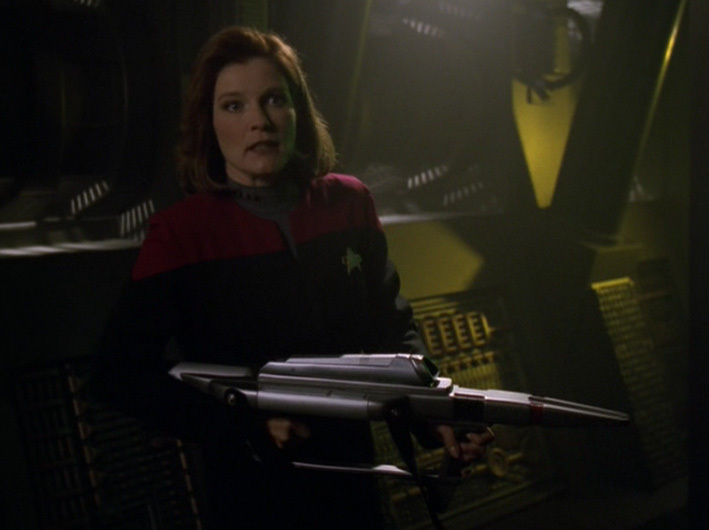 However, this minor scrap of dialogue is quite tantalizing: what are smaller phaser rifles? 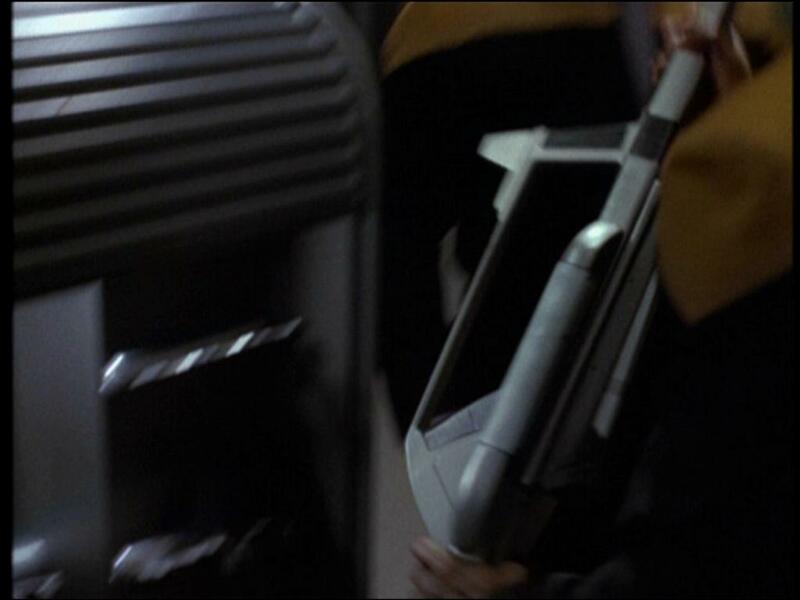 Compression rifles are quite bulky, so he could mean the First Contact Type-IIIs? 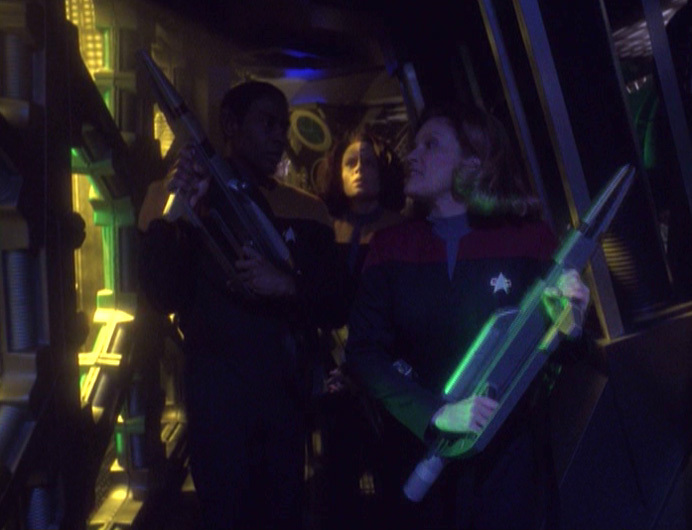 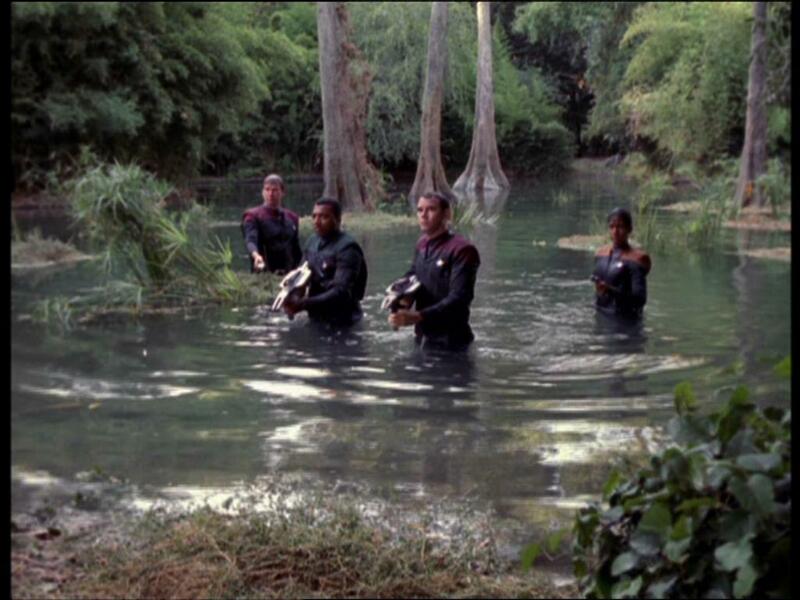 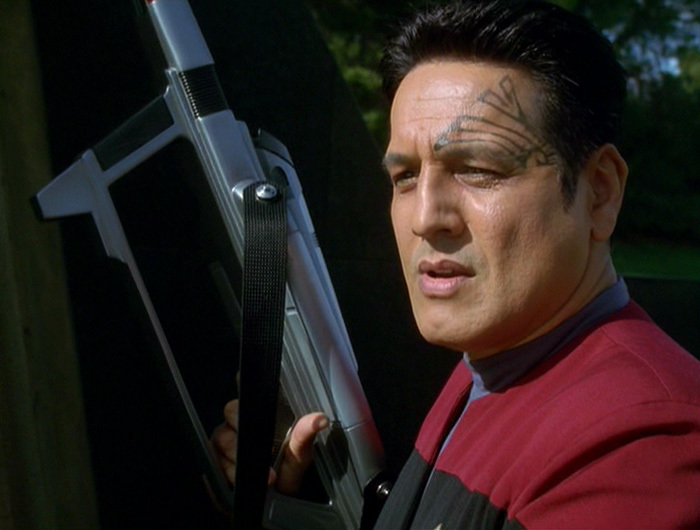 Or, perhaps, the Next Generation-era rifles never seen on Voyager? 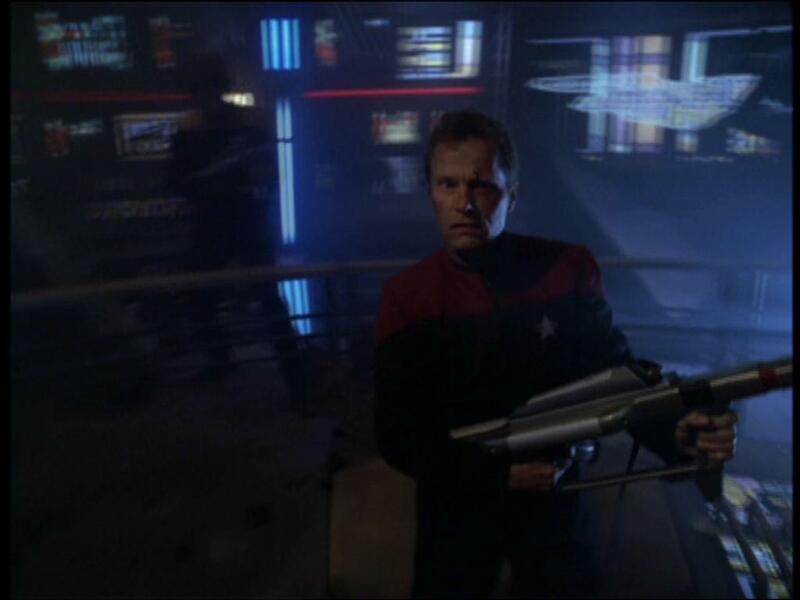 Terry Reynolds pointed out to me that two variants of the Compression rifle were used, the main difference being in the light emitter. 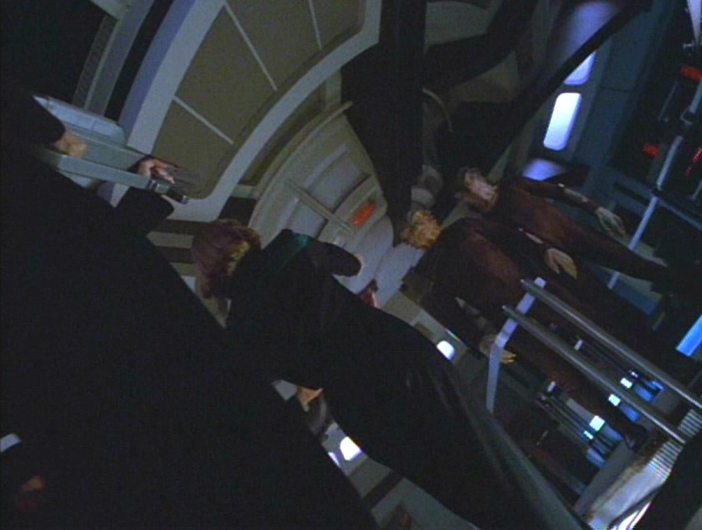 The original angled down and forward, while the later variant angled up and forward to a large light source. 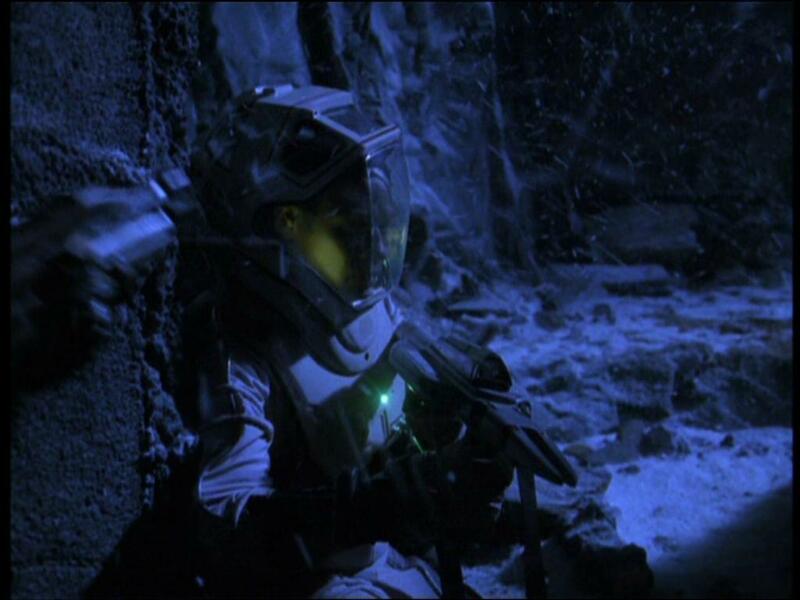 Terry's also done some research which confirms the original was in use between "Caretaker," and "Message in a Bottle". 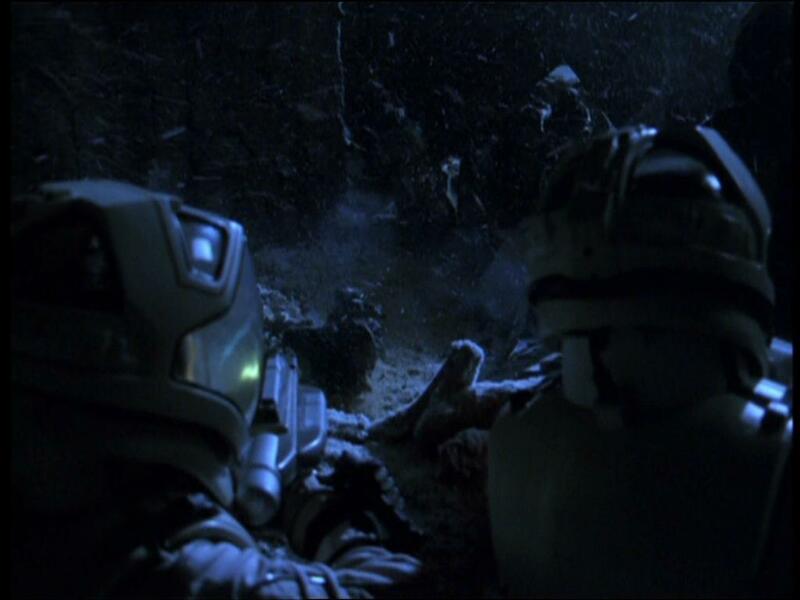 Jörg Hillebrand is in agreement: "the new rifles with the reversed light emitter were first seen in "Night". 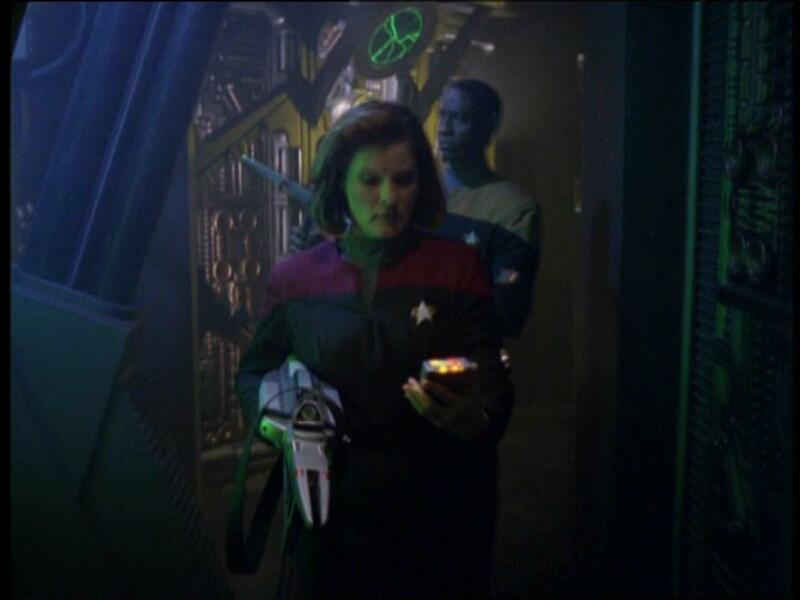 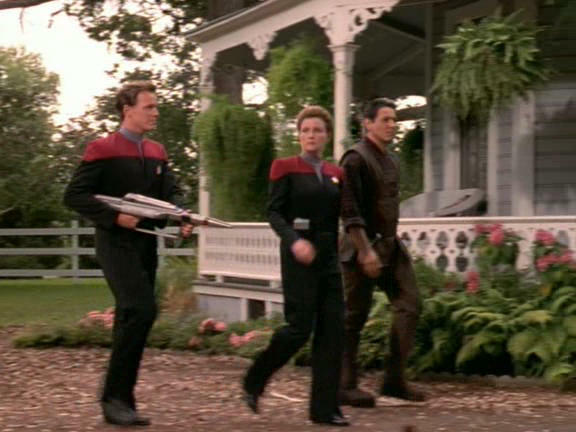 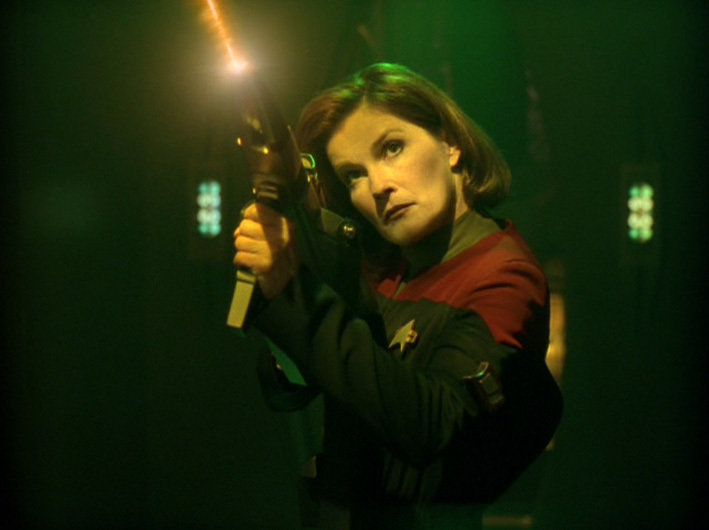 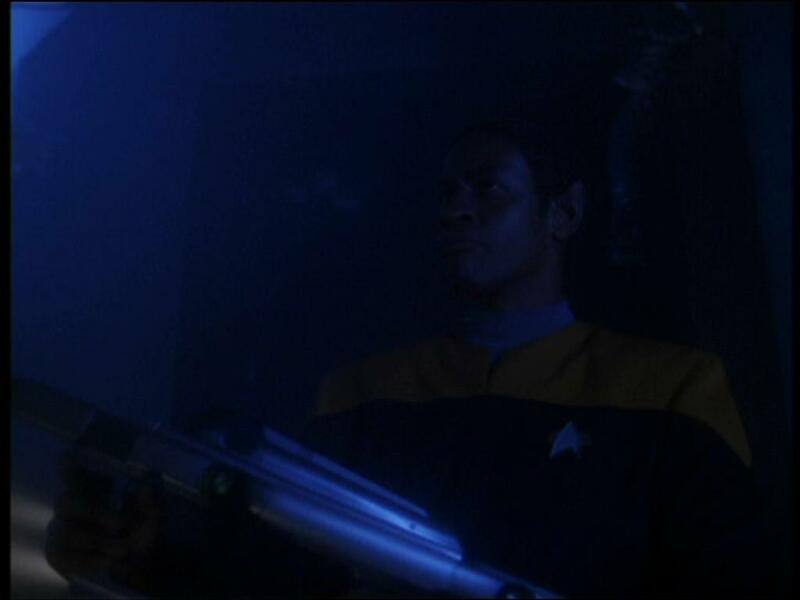 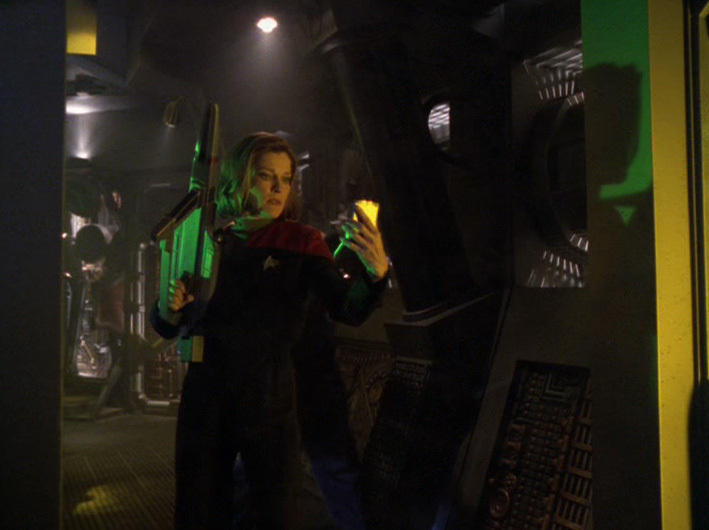 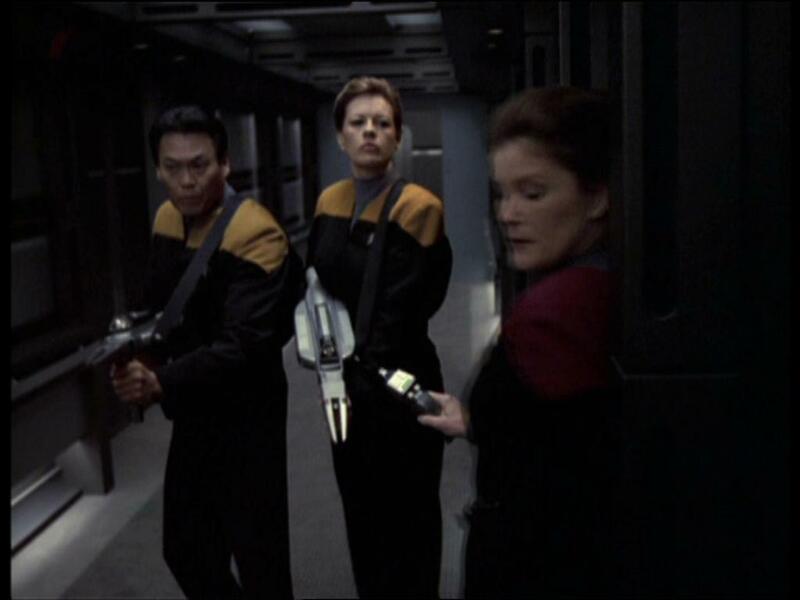 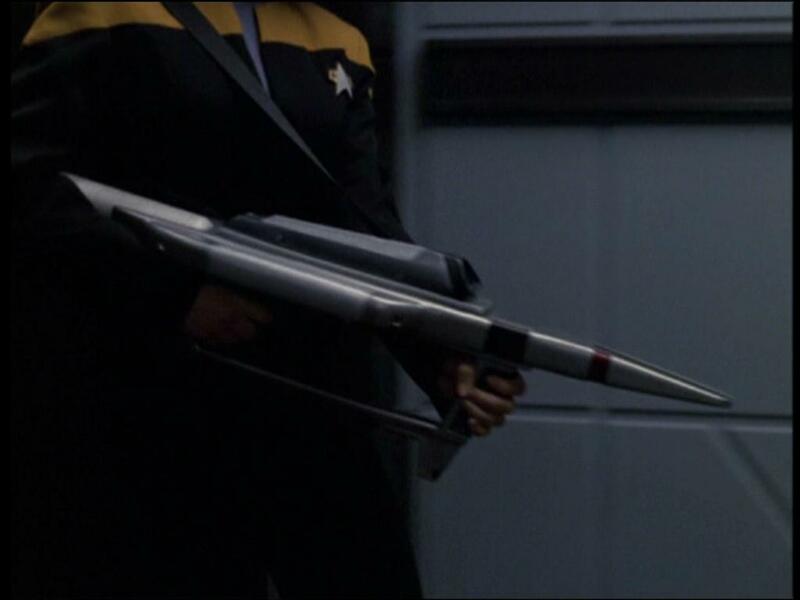 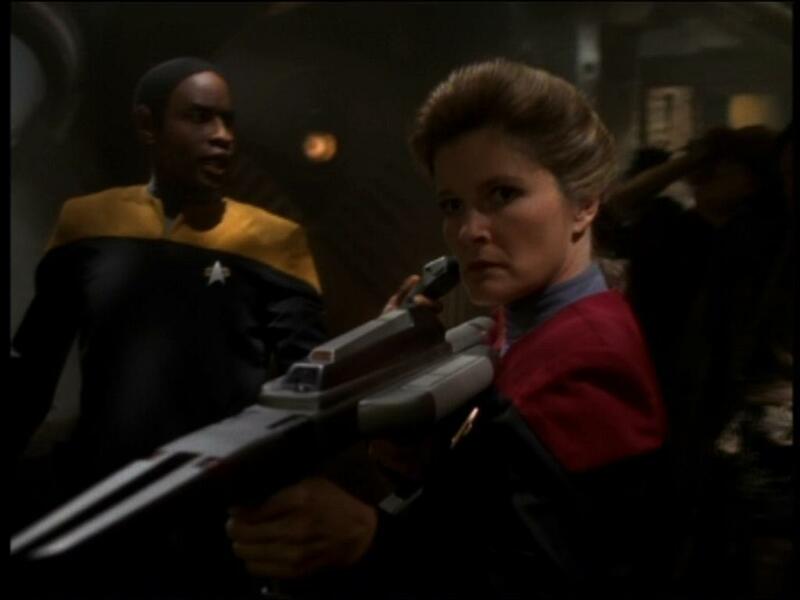 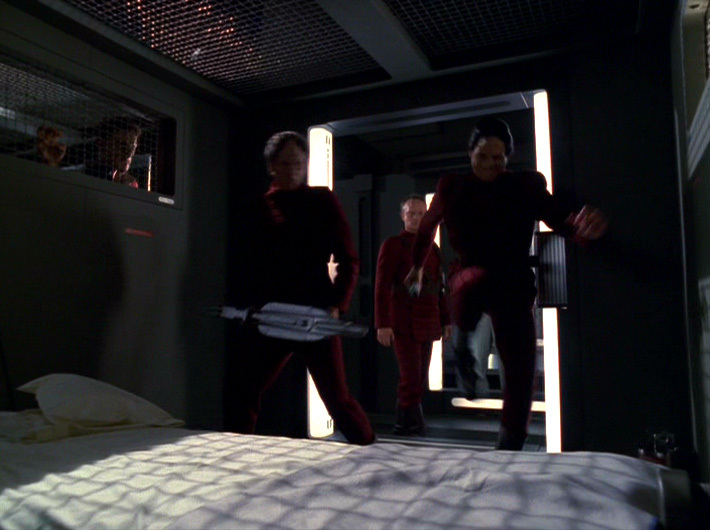 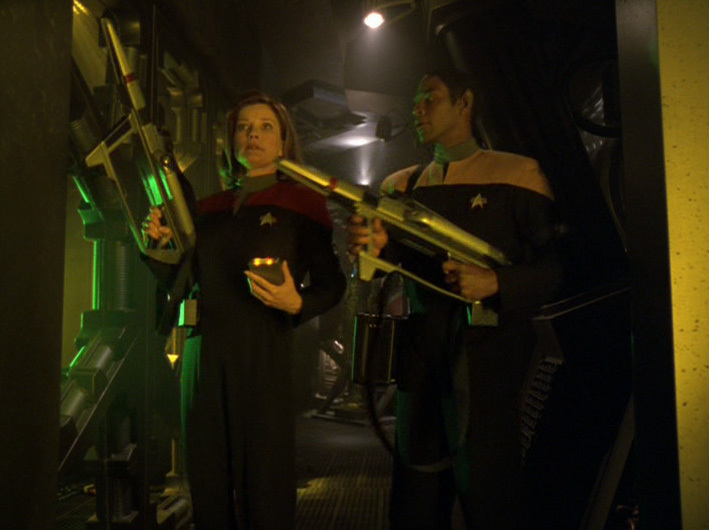 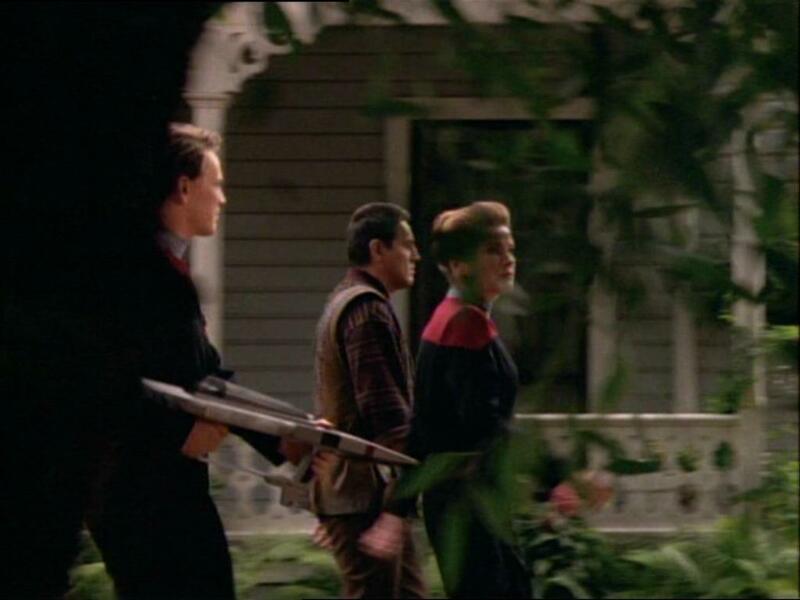 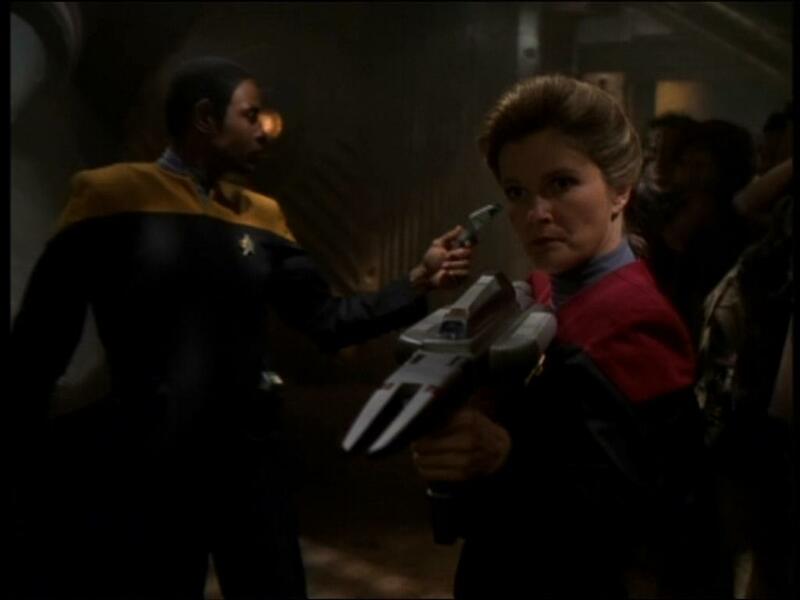 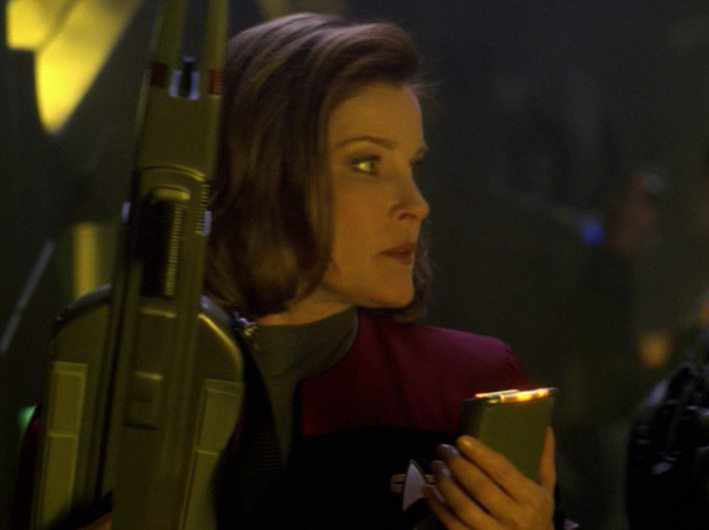 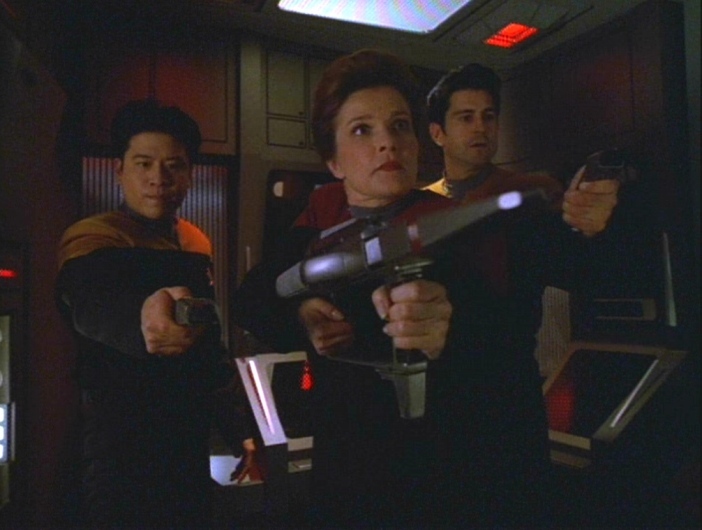 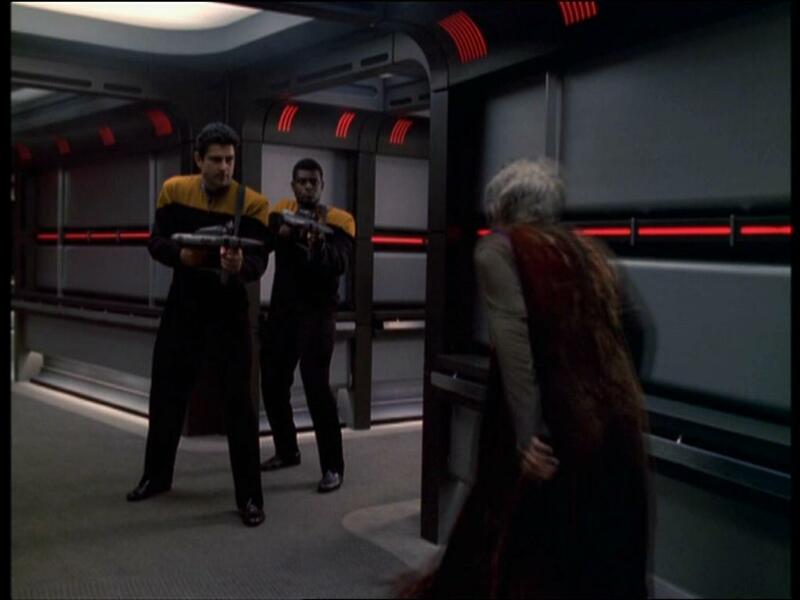 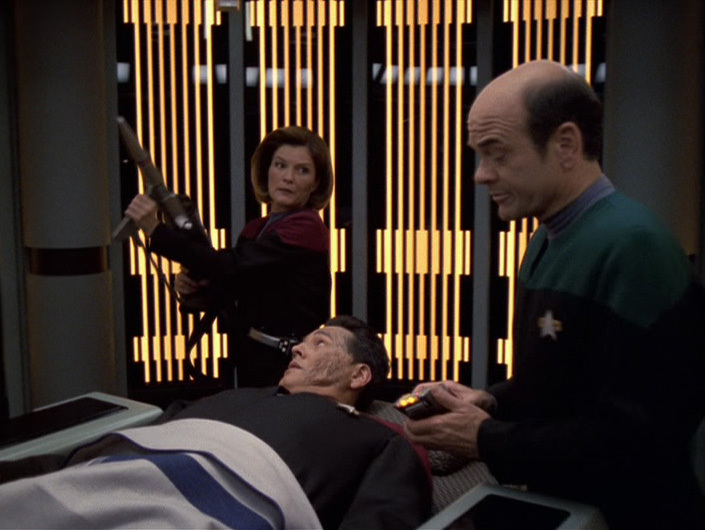 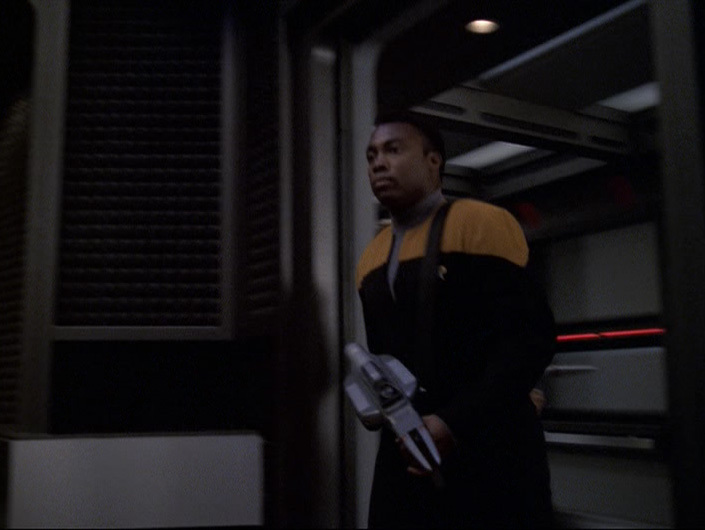 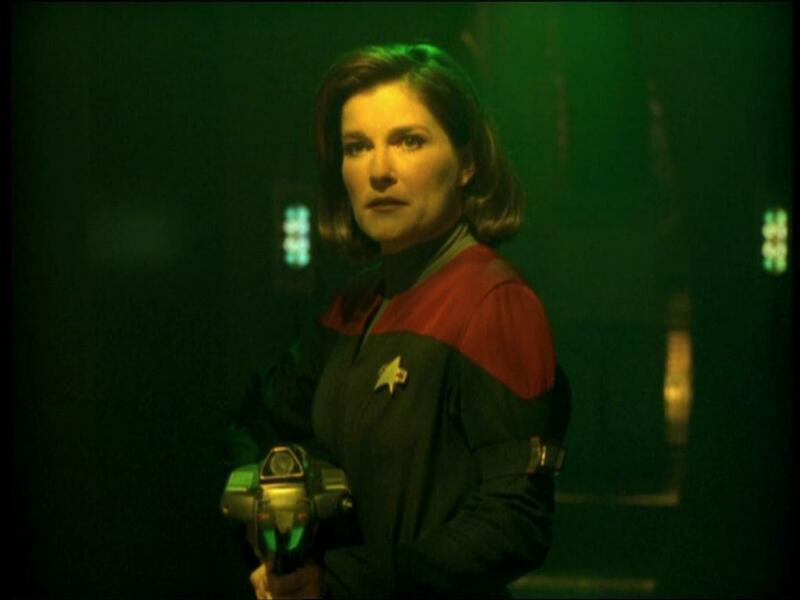 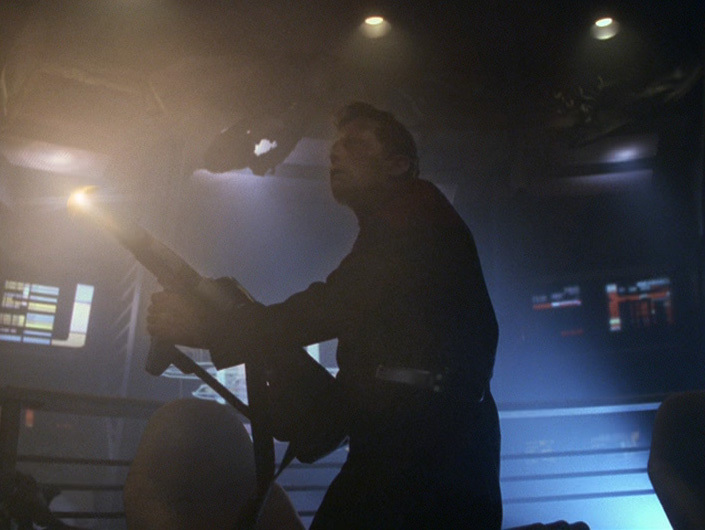 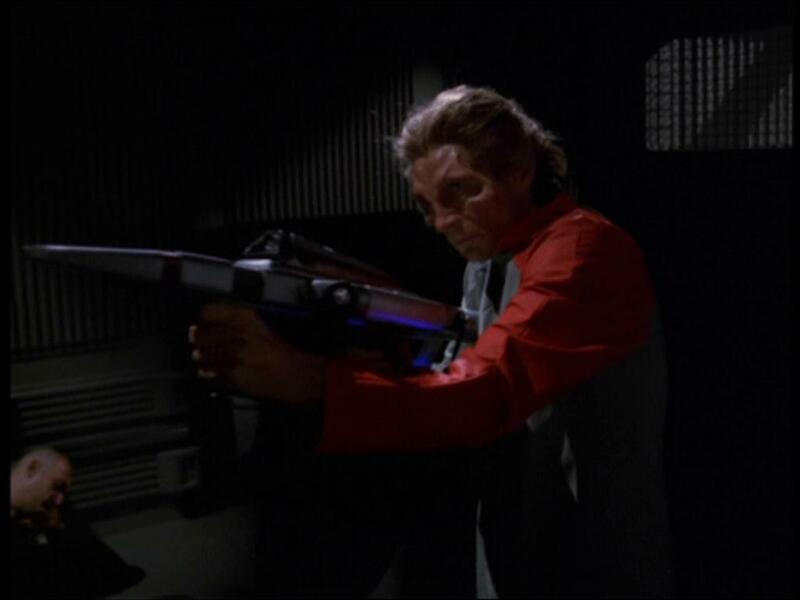 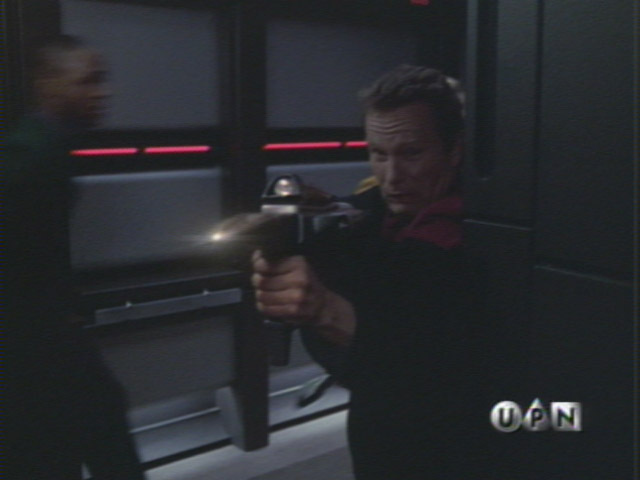 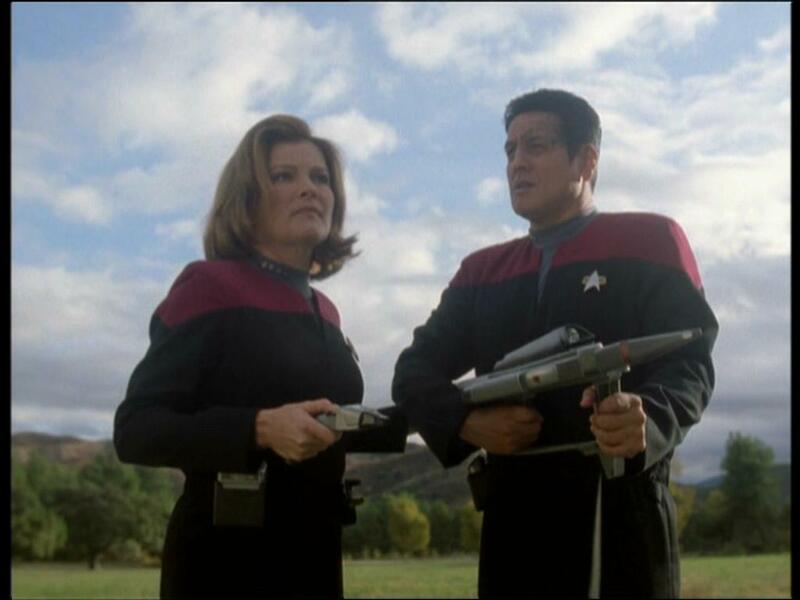 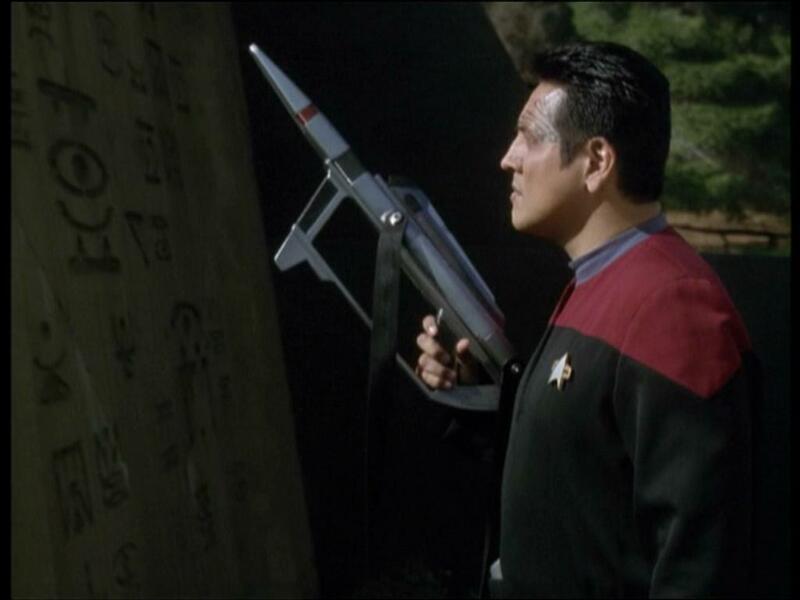 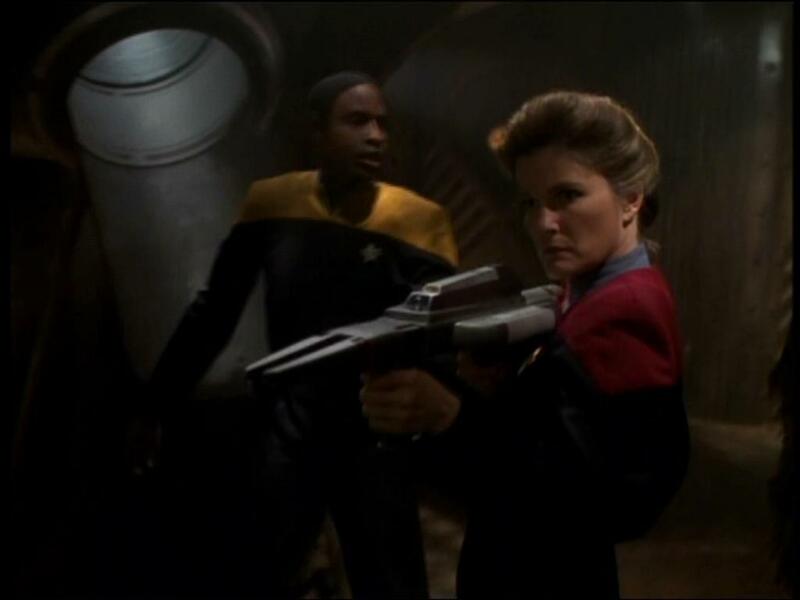 Again, there's a reason why the rifle was modified like that: When the ship goes all dark, Janeway is seen running around with the rifle. 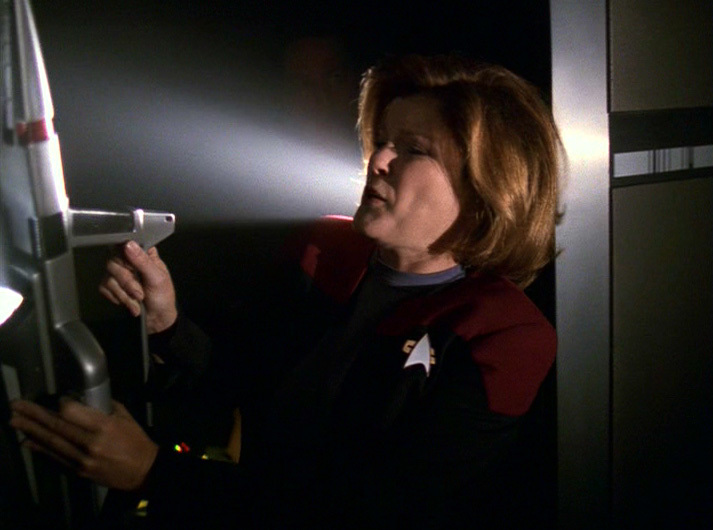 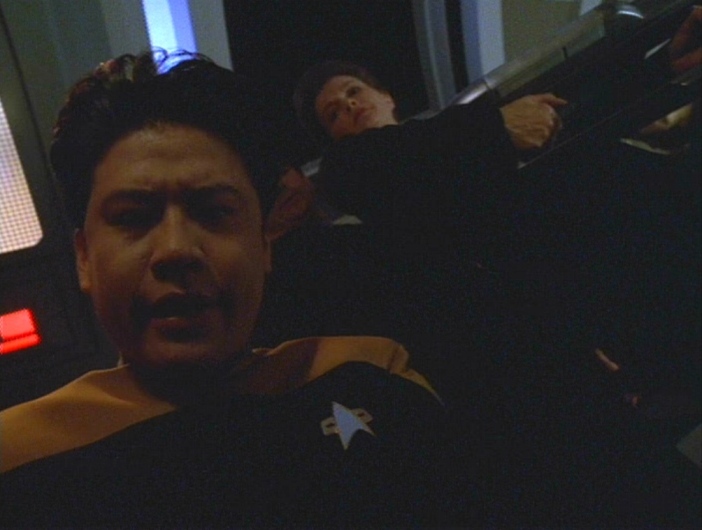 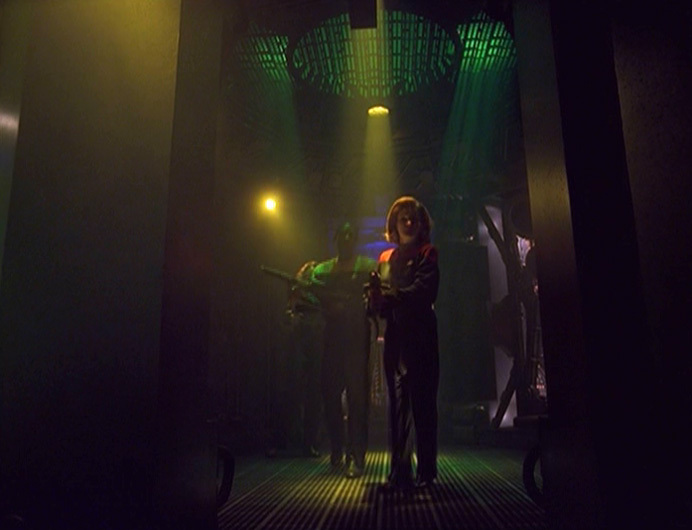 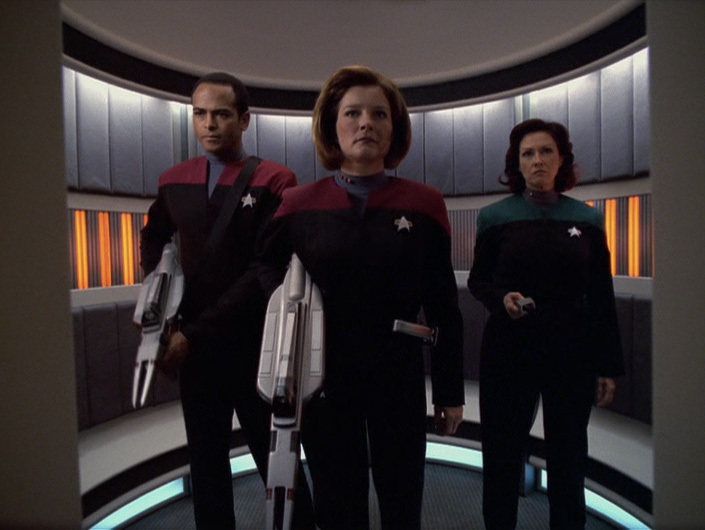 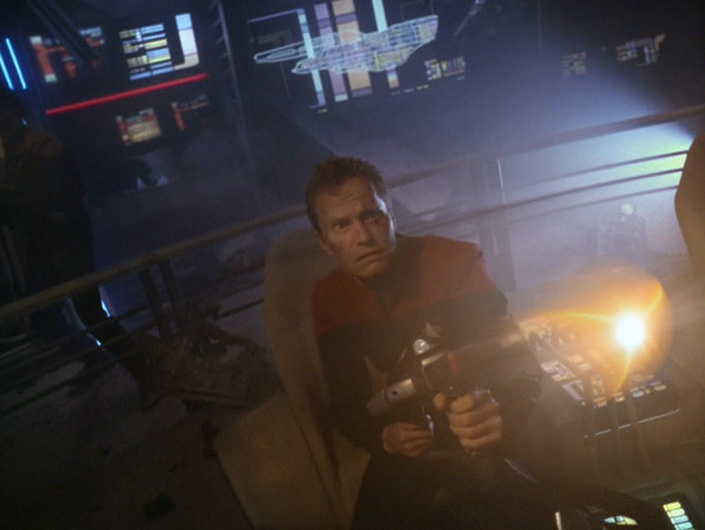 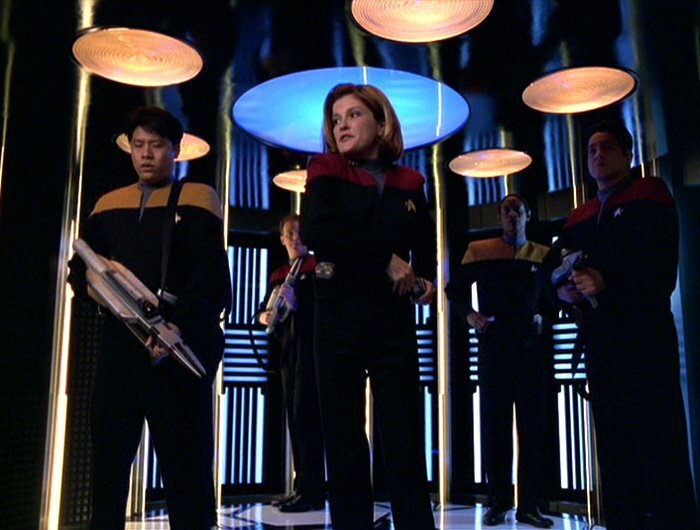 The light emitter needed to be attached, otherwise Janeway (and the audience) wouldn't have seen anything. 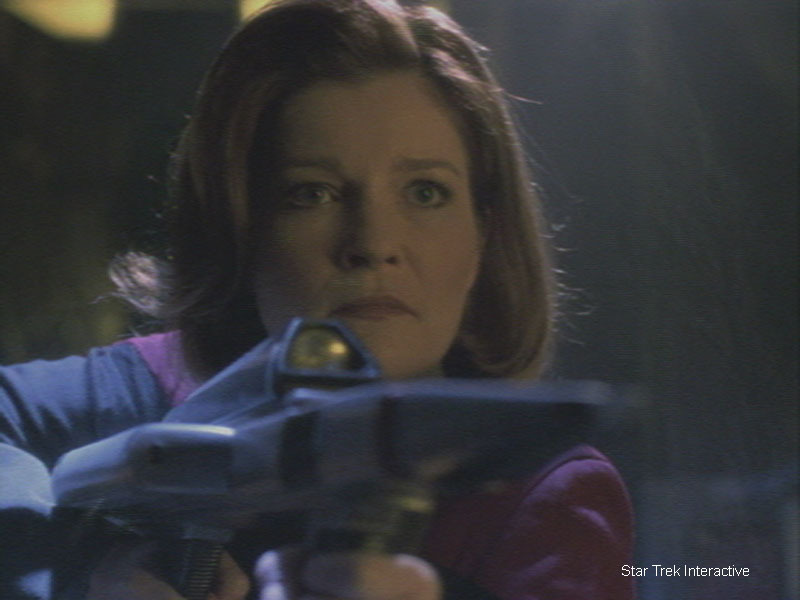 The regular SIMs beacons wouldn't have been enough, especially when Janeway is pointing the rifle at the Night aliens. 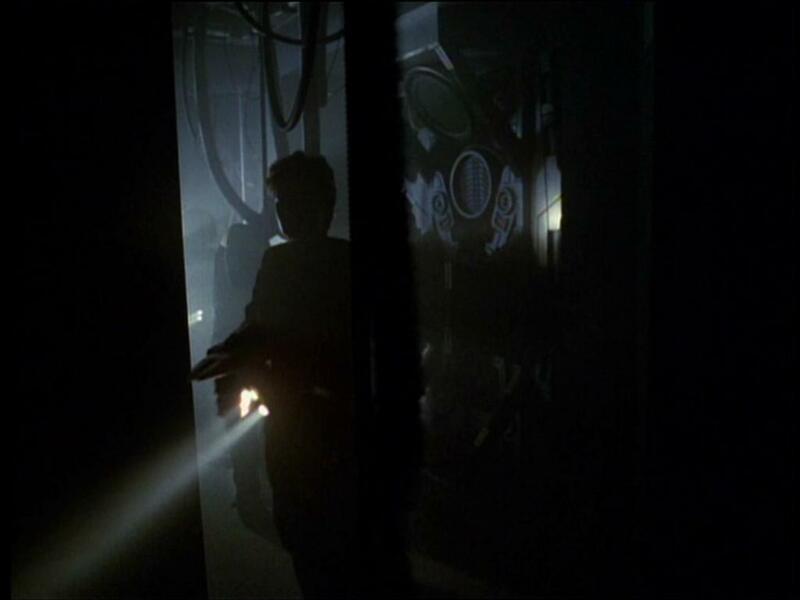 The scene required that a light had to be shone into their face, so they would react scared. 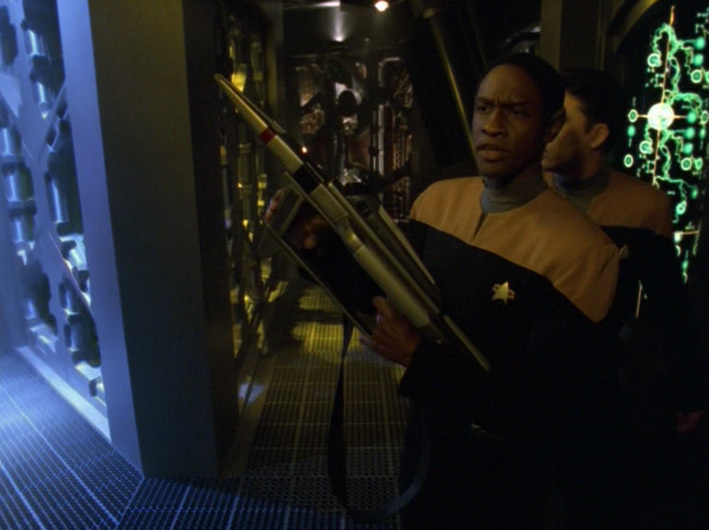 So, for that episode, all rifles were modified, simply because the script required the change."